Frances Fox Piven and Richard Cloward analyse the movement of industrial workers and the role of the unions following the great depression, from the sitdown strikes to the union no strike deals of World War II. The experience of labor unions in the United States is the historical bedrock on which the organizer's credo is grounded. As organizers recount this history, factory workers finally organized into large, stable organizations after much bloody travail, and were then able to exert influence in the factory. Moreover, organization was said to have yielded influence in politics as well. The large voting numbers and financial resources which the unions accumulated presumably gave working people a measure of political power. To be sure, some believers in the credo are disappointed in the way unions have used their power, blaming an oligarchical leadership for a narrow preoccupation with wages and hours as for the avoidance of more fundamental economic and political issues. However, the belief that working people were able to gain both economic and electoral power through organization still holds firm. It is this belief that suggests to organizers the model other powerless groups should follow. But on closer historical scrutiny, the bedrock turns out to be sand. Factory workers had their greatest influence and were able to extract their most substantial concessions from government during the early years of the Great Depression before they were organized into unions. Their power was not rooted in organization, but in their capacity to disrupt the economy. For the most part strikes, demonstrations, and sit-downs spread during the mid-1930s despite existing unions rather than because of them. Since these disorders occurred at a time of widespread political instability, threatened political leaders were forced to respond with placating concessions. One of these concessions was protection by government of the right to organize. Afterwards, union membership rose, largely because government supported unionization. But once organized, the political influence of workers declined. The unions not only failed to win new victories from government commensurate with the victories of unorganized workers during the 1930s, but those already won were whittled away. Before we go on to offer our explanation of why industrial workers became a political force during the depression, we need to say a little about their lack of force before the depression. When industrial workers band together they have power in their dealings with capital, or so it would seem. Their power is of course the disruptive power of the strike. If workers withhold their labor, production is halted and profits dwindle, and employers are pressured into making concessions. Moreover, as economic concentration proceeds, and the scale of enterprises and their interpenetration in creases, the power of labor ought to increase as well. Not only do large-scale enterprises facilitate collective action among workers, but the impact of strikes is more severe, reverberating throughout an interdependent and concentrated economy. All this may seem to be true in principle, but in historical fact it has not been. Between the onset of rapid industrialization at the end of the nineteenth century and the Great Depression, the history of strikes in mass production industries was largely a history of failure. The explanation of this failure has preoccupied students of labor history. The interpretations which have resulted tend to fasten on divisions in the American working class which inhibited the solidarity necessary for effective strike action: the corrosive effect of the business cycle on labor unity; deep status and ethnic conflicts among workers; the divisive effects of the promise and reality of upward mobility; and the oligarchical and exclusionary character of such unions as did exist. We will briefly review each of these explanations, for we think they help to explain the weakness of strike power. There can be no doubt that solidarity was essential to the effectiveness of strikes, for without it striking workers were easily replaced and production was easily continued. And there can be no doubt that American workers were divided. These divisions had their roots in features of the American economy and in the characteristics of the American working population, as well as in deliberate practices of employers de signed to exacerbate divisions in order to turn workers against each other. With this review made, however, we will go on to argue that divisiveness among American workers fails to account adequately for the defeat of labor struggles. In instance after instance, worker struggles did not collapse from lack of internal unity; they were smashed by the coercive power of the state. First and most obviously worker solidarity was influenced by market conditions. Workers could join together in strikes and slow downs more readily when business prospered and when the demand for labor was strong. But during periods of depression, men and women were laid off, wages were cut, and hours were lengthened. Defensive strikes and riots sometimes erupted during depressions, but they usually had little effect. Not only did employers find it easier to resist strikes when trade was slow and there was less to be lost by halting production, but with jobs scarce, workers were forced to undersell each other in the scramble for employment. Workers' associations which emerged during boom times were unable to resist these forces; they were usually simply wiped out when the market fell. Second, solidarity was also inhibited because the American working population was fragmented by intense divisions determined by occupational status, by race, and by ethnicity. The result was a commensurately weak recognition of class commonalities. To some extent, these divisions were a natural and inevitable result of the heterogeneous origins of the American working population. But it was also the policy of employers to take advantage of such distinctions to elaborate them, and by doing so, to weaken working-class solidarity. Thus it is well known that the status-conscious artisans of the nineteenth century looked down on the growing stratum of unskilled workers created by industrialization. This sense of themselves as a class apart was strengthened when industrialists agreed to bargain only with skilled workers during mass strikes. By the end of the nineteenth century, as advancing mechanization drove many skilled workers into the ranks of the unskilled, and as a series of large-scale Industrial strikes were defeated, status anxieties and simple fear combined to heighten craft exclusiveness among the remaining skilled workers. Even as this leveling process went forward, the advantages of occupational and status distinctions appear to have been recognized by industrialists, and under the banner of "scientific management" some industries adopted the deliberate policy of elaborating job distinctions, both hierarchically and horizontally, thus multiplying divisions among workers. "I saw, seated on benches around the office, a sturdy group of blond- haired Nordics. I asked the employment agent, "How comes it you are employing Only Swedes?" He answered, "Well, you see, it is only for this week. Last week we employed Slovaks. We change about among different nationalities and languages. It prevents them from getting together, We have the thing systematized" (Lescohier and Brandeis, xxv). Brecher cites a Carnegie plant manager writing in 1875: "My experience has been that Germans and Irish, Swedes and what I denominate 'buckwheats' (young American country boys), judiciously mixed, make the most effective and tractable force you can find" (120). As late as 1937, the Jones and McLaughlin Steel Corporation maintained rigid segregation between nationality groups, skillfully playing one off against the other (Bernstein, 1971, 475). Such practices were, of course, far more likely to be resorted to during strikes, when immigrants and native blacks were used as strikebreakers. Third, in comparison with Europe, workers in America had greater opportunities for both economic and geographic mobility, at least until the end of the nineteenth century. Wages in the new country were higher; as manufacturing expanded, opportunities seemed to abound, at least for the lucky, the skilled, the ambitious, and at least during periods of prosperity. Moreover, for those who were not destitute, there was the opportunity for free land and free mining in the west. Commons noted that the leaders of defeated labor struggles in the East could often be found on the free land of the West (Lescohier and Brandeis, xiii). Indeed, the Homestead Act which opened up the public domain in the West is generally regarded as a concession to labor, a concession which did not improve the lot of factory workers, but which gave a few of them the alternative of not being factory workers. Opportunity for advancement or for land thus drained off some of the more discontented and perhaps the more able, and also helped to sustain among those left behind the hope that they too could move upward, that their future lay not with collective struggles of the present, but with the individual opportunities of a future day. Still another factor inhibiting and weakening industrial struggles was the status-conscious and oligarchical character of those workers' organizations that did develop. These were usually local unions of artisans whose ability to organize owed much to a tradition of brotherhood and pride in craft, as well as to the leverage that such organized craftsmen could exert in industries where they controlled entry into their occupations. These sources of strength, however, encouraged them to ignore and even to scorn the growing mass of unskilled workers. Moreover, the inevitable tendencies toward oligarchy, noted by Michels in Europe, seem to have been stronger within the craft unions in the United States, perhaps because class consciousness was weaker, mobility strivings sharper, and the business ethos more widely shared by workers and their leaders. Over time, the leaders of craft unions came to function more as labor contractors than as labor leaders, depending more on collusive arrangements with employers for the maintenance of their leadership positions than on a united and militant following. The result was a leadership that was less and less inclined to engage in strikes or agitation, and less and less interested in recruiting a mass following. When mass strikes did occur, they were often opposed by established union leaders, some of whom went so far in the big strikes of the late nineteenth and early twentieth centuries as to encourage their members to engage in strikebreaking. In the preceding paragraphs, we have tried to summarize the prevailing explanations of American labor's inability to make much progress before the Great Depression. It is our view, however, that explanations pointing to divisions among industrial workers miss the main point. Mass strikes did occur, and the strikers often held fast, obdurate in the face of overwhelming economic necessity. The ultimate enfeeblement of workers was not just their lack of solidarity, and their consequent lack of economic power, but their lack of political power. Whatever force workers mounted against their bosses, whatever their determination and their unity, they could not with stand the legal and military power of the state, and that power was regularly used against them. During the colonial period, industrial codes established maximum wages, declared work compulsory, and forbade the combination of workmen for the purpose of raising wages (Raybeck, 12). The courts continued to view unions as criminal conspiracies until 1842 (Fleming, 123). As time went on, the laws regulating labor softened, but the practices of government did not. Until the Great Depression, striking workers were regularly subject to court injunctions and criminal prosecutions. And what could not be done by law was done by military force. Company troops, deputized for the occasion by local sheriffs, state militia, and federal troops, were all deployed time and again to attack strikers and to protect strikebreakers. In the face of this kind of opposition, strikes were bound to fail, no matter whether the workers were united or not. Some of the bitterest examples of the use of force by government against strikers occurred during the severe depressions of the late nineteenth century when unemployment and wage cuts made people desperate, and the scale of the calamity forged a unity among workers which led to epidemics of protests. In 1877, when four years of severe depression had led to sharp wage cuts and left perhaps one million industrial workers unemployed, a strike on the Pennsylvania and Baltimore and Ohio railroads led to riots that swept through a dozen major rail centers, escalating to open conflict between workers and troops. When local police and state militia were unable to handle the disturbances-in Pittsburgh, for example, police and militia were openly sympathetic with the mob that was burning railroad property to the ground-3,000 federal troops were rushed from city to city under the direction of the War Department. Order was finally re stored, leaving twenty-six dead in Pittsburgh, where the mob openly resisted; thirteen dead and forty-three wounded in Reading, Pennsylvania; nineteen dead and more than one hundred wounded in Chicago (Brecher, 1-23). Property damage reached about 5 million (Walsh, 20). It was subsequent to these upheavals that the huge National Guard Armories were constructed in the heart of America's big cities (Josephson, 365). A decade later, a new depression triggered another, even greater, uprising of workers, and again the strikes were broken with the aid of police and militia, justified this time by the Haymarket bombing incident. The scenario was reenacted again in the depression of the 1890s when wage cuts and rising unemployment in manufacturing and transportation precipitated strikes involving some 750,000 workers, primarily in steel, in mining, and in the railroad industry. In Pennsylvania, the governor called out 7,000 troops to deal with the Homestead steel workers; in Idaho, in the Coeur d'Alene region, National Guard and federal troops rounded up all union miners and put them in a stockade where they were held for months without charges. The Pullman railroad strike of 1894 brought thousands of federal troops to Chicago, with the result that an estimated thirty-four people were killed, and Eugene Debs was imprisoned. Subsequently, the federal government stationed marshals in numerous railroad centers to protect railroad property, at a cost of at least $400,000 (Taft and Ross, 290-299; Greenstone, 2l). "We have only got a number, and a limited number, of poorly paid men in our organization, and when their income ceases they are starving. We have no power of the Government behind us. We have no recognized influence in society on our side. . . . On the other side, the corporations are in perfect alliance; they have all the things that money can command, and that means a subsidized press, that they are able to control the newspapers, and means a false or vitiated public opinion. The clergy almost steadily united in thundering their denunciations; then the courts, then the State militia, then the Federal troops; everything and all things on the side of the corporations (cited in Brecher, 94)." "The United States Steel Corporation was too big to be beaten by 300,000 working men. It had too large a cash surplus, too many allies among other businesses, too much support from government officers, local and national, too strong influence with social institutions such as the press and the pulpit, it spread over too much of the earth-still retaining absolutely centralized control-to be defeated by widely scattered workers of many minds, many fears, varying states of pocketbook and under a comparatively improvised leadership (quoted in Walsh, 56)." In a handful of instances, government remained neutral or supportive, and that spelled the difference between the success and failure of strikes. For example, during the uprisings of the 1890s, while federal and state troops were being used to break strikes elsewhere, the UMW called a national strike in an effort to organize the central competitive coalfields. When two recalcitrant companies in Illinois imported scabs whom the striking miners prevented from entering the mining areas, Governor John B. Tanner of Illinois sent National Guardsmen to avert the threat of violence, but with instructions not to assist the mine owners. Both companies eventually signed with the UMW (Taft and Ross, 300-302). It is often said that employers in the United States were exceptional for the virulence of their opposition to the demands of workers. Their opposition is not difficult to understand. But who is to say that they would have been successful in the face of large-scale strikes had not government on all levels regularly come to their aid? In other words, without the power to restrain their presidents their governors, and often their mayors from using troops against them, workers remained helpless, stripped of the economic power of the strike by the coercive power of government. That this was so in the nineteenth century was perhaps partly because the political power of employers, based on economic power, was not yet tempered by the mass numbers of a large industrial class. The United States remained predominantly a country of independent farmers and proprietors until the Civil War. Moreover, even after industrialization had advanced, and even after the number of wage workers grew, a rural, small proprietor view of American life, and of the role of private property in American life, continued to dominate the political culture. By 1880, wage and salaried employees accounted for 62% of the labor force, and farmers and small proprietors accounted for only 37% (Reich, Table 4-J, 175). But these numbers were still submerged by a political ideology that, by denying the realities of economic concentration, may have thwarted the popular emergence of urban, working-class interests, at least on the national and state levels. Perhaps a more important factor than American political culture in accounting for the absence of class-oriented politics was the development of political institutions that created the illusion of popular participation and influence. Long before an industrial working class had developed, American workers were given the franchise, in most states by the 1820s. One result was that the political alienation to which Bendix ascribes the European working class movements of the nineteenth century did not emerge so acutely in the United States, for workers were at least granted the vote, the symbol of political influence, and they were included in the rituals of political participation as well. Thus artisans reacted to the depression of 1828-1831 by forming workingmen's parties, particularly in New York and Philadelphia. They created a stir sufficient to produce some concessions, such as the end of imprisonment for debt and free public schools. Meanwhile, leaders of the workingmen's party in New York City were inducted into Tammany (Pelling, 32-33). These precedents were to be repeated and expanded as the working class enlarged. Big city machines were able to win and hold the allegiance of workers by absorbing their leaders and by conferring favors and symbols that sustained the loyalties of workers on individual, neighborhood, and ethnic bases. This not only prevented the emergence of industrial workers as a political force directed to class issues, but it actually freed political leaders on all levels of government to use police, militia, and troops against striking workers without jeopardizing working-class electoral support. In the l930s, this pattern was broken and government was forced to make accommodations to industrial workers, as industrial workers. Staughton Lynd puts the change succinctly: "Not only in the l890s but equally in the period after World War I, the national government smashed emerging industrial unions. In the 1930s, the national government sponsored them" (Lynd, 1974, 30). The structural changes that presaged this new accommodation had been proceeding rapidly as industrialization increasingly dominated American life. The transformation was complete and precipitate. In 1860 the United States ranked behind England, France, and Germany in the value of its manufacturing products; by 1894 the United States was not only in the lead, but its manufacturing products nearly equaled those of England, Germany, and France together (Gutman, 33). In the next few years, concentration proceeded apace as mergers and consolidation resulted in the creation of corporations with billions of dollars in assets. By 1904 the top 4 percent of American concerns produced 57 percent of the total value of industrial products (Weinstein, 1). And by 1910 overall investment in manufacturing had increased twelve-fold over 1860 (Brecher, xii). As a result, the number of workers employed in industry also increased to about 40 percent of the labor force (Reich, Table 4-L, 178), and these workers were concentrated in ever-larger industrial empires. Taken together, these changes set the stage for the successful struggles of the 1930s. The advance of industrialization meant that when the economic collapse of the 1930s occurred, no sector of the economy was insulated, and no sector of the population spared. The discontents which galvanized workers also affected virtually the entire population, with the result that worker agitations were more threatening to political leaders. At the same time the industrial working class itself had enlarged, and its role in the economy had become more central, so that workers themselves were more menacing when insurgent. But if these structural changes created the pre conditions for a political accommodation by government to industrial workers, the change was not to come until the workers them selves rose up in defiance with such disruptive effects that they forced the hand of the state. Publicly the White House responded to the crash of 1929 and to rapidly mounting unemployment by issuing a steady stream of good cheer, declaring that the economy was fundamentally sound and that employment was picking up. Privately, however, Hoover was apparently less sanguine. In late November he called a conference of leading industrialists at which he described the situation as serious, and urged industry to help minimize panic by maintaining the existing level of wages. For the first year, at least, most of the nation's big corporations cooperated, and wages held relatively firm for those still working. But the depression rapidly worsened to the point that industry approached collapse. By 1932 half of all manufacturing units had closed down; production fell by 48 percent; reported corporate in come fell from $11 billion to $2 billion; the value of industrial and railroad stock fell by 80 percent; and the numbers out of work continued to rise. An estimated 8 million were jobless by the spring of 1931, 13.5 million by the end of 1932, and over 15 million, or one-third of the work force, in 1933. With declining production and widespread unemployment, the policy of maintaining wage levels was doomed. Smaller companies began to cut wages first. By the fall of 1931, when the net income of the nation's 550 largest industrial corporations had declined by 68 percent, United States Steel announced a 10 percent wage cut, and the rush to cut wages was on. Those still working in the summer of 1932 suffered a drop in average weekly earnings from $25.03 to $l6.73. Wage cuts were more severe in mining and manufacturing where unemployment was also worse and less severe among railroad workers, but the overall drop in wages, together with unemployment and the spread of part-time employment, meant that the income of the labor force had been cut in half, from $51 billion in 1929 to $26 billion in 1933 (Raybeck, 321). During these first years of the depression, the distress produced by rapidly declining wages remained mainly within private spheres; most workers bore the hardships quietly, perhaps made fearful by the masses of unemployed at the factory gates. The reluctance of elites to acknowledge that much was amiss helped to turn distress inward, to keep the disorder of private lives from becoming a public issue. But as business conditions worsened, as unemployment spread, and as local relief efforts broke down, that began to change. By mid-1931, the depression was being acknowledged, helping the grievances in private lives to acquire a public meaning and releasing public indignation. In September 1931, the American Legion announced that "the crisis could not be promptly and efficiently met by existing political methods." Theodore Bilbo told an interviewer: "Folks are restless. Communism is gaining a foothold. Right here in Mississippi, some people are about ready to lead a mob. In fact, I'm getting a little pink myself" (Schlesinger, 1957, 204-205). The Republican governor of Washington declared: "We cannot endure another winter of hardship such as we are now passing through" (Rees, 224). Edward F. McGrady of the AFL told the Senate Subcommittee on Manu factures: "I say to you gentlemen, advisedly, that if something is not done . . . the doors of revolt in this country are going to be thrown open" (Bernstein, 1970, 354). Somewhat later, in February 1933, Ernest T. Weir, Chairman of the National Steel Corporation, testified before the Senate Finance Committee: "Practically all the people have suffered severely and are worn out not only in their resources, but in their patience." John L. Lewis went further, pronouncing: "The political stability of the Republic is imperiled" (Bernstein, 1971, 15). "This outburst at High Point and Thomasville was almost spontaneous and spread like the plague. It only confirms my general feeling that the spirit of revolt is widespread. . . . This thing burst forth from the nervous tension of the people who have lost and lost and many of whom are now engaged in the battle for the bare necessities of life (quoted in Bernstein, 1970, 421-422)." That summer, hard-pressed farmers in North Dakota, Michigan, Indiana, Ohio, New York, and Tennessee armed themselves with clubs and pitchforks to prevent the delivery of farm products to towns where the prices paid frequently did not cover the costs of production. These Outbreaks were dangerous portents. Still, considering the scale of the calamity that had overtaken them, most workers had remained relatively quiescent. Their first large-scale expression of discontent was to occur not in the streets, but at the polls, in the dramatic electoral realignment of 1932 when masses of urban working-class voters turned against the Republican Party to vote for a president of "the forgotten man." When Roosevelt took office in the spring of 1933, the scale of the catastrophe was apparent to all. Industrial production had sunk to a new low and, by the day of the inauguration, every bank in America had closed its doors. Once in office, the new administration took the initiative, and there was little resistance from a stunned nation or a stunned Congress. Clearly the election was a mandate to attempt recovery, but economic panic and the electoral upset gave Roosevelt a relatively free hand in fashioning his early legislation. He proceeded to launch a series of measures, each to deal with a different facet of the breakdown, and each to Cultivate and solidify a different constituency: farmers and workers, bankers and businessmen. Farmers got the Agricultural Adjustment Act, rewarding their half-century struggle for price supports, cheap credit, and inflated currency. The unemployed got the Emergency Relief Act. Business and organized labor got the National Industrial Recovery Act (NIRA). For business, the NIRA meant the right to limit production and fix prices. For working people, the NIRA included codes governing wages and hours, and the right to bargain collectively. Those provisions were to have an unprecedented impact on the unorganized working people of the country, not so much for what they gave, as for what they promised. The promises were not to be kept, at least not at first. But that the federal government had made such promises at such a time gave a new spirit and righteousness, and a new direction, to the struggles of unorganized workers. Franklin Delano Roosevelt was no brinks man; he was trying to build and conserve support wherever possible. The NIRA was designed to promote economic recovery, and this purpose was as much political s economic, for continuing depression spelled continuing political disaffection and uncertainty. Moreover the method for recovery was also political. The NIRA created a mechanism by which industry could regulate production and prices without the constraints of antitrust legislation. This was precisely what business leaders them. selves had been asking for. As early as November 1930 Bernard Baruch had called for modification of the antitrust laws and the abatement of "uneconomic competition" through business self-regulation under government supervision. In October 1931, the Committee on Continuity of Business and Employment of the Chamber of Commerce had endorsed proposals for industrial planning under government sanction. Even the National Association of Manufacturers approved. But while the NIRA was designed and implemented to conciliate business, it was not meant to offend anyone either and three passages were included to provide reassurance to organized labor. Section 7 written in consultation with the American Federation of Labor, required that every industry code or agreement promulgated under the statute provide "that employees shall have the right to organize and bargain collectively through representatives of their own choosing, and shall be free from the interference, restraint or coercion of employers." Business was by no means happy with this provision; the National Association of Manufacturers and the Iron and Steel Institute made their opposition clear from the outset. But the Chamber of Commerce took a different tack and privately agreed With the AFL on an exchange of support (Bernstein, 1971, 32). In other words, some business leaders were reluctantly prepared to allow the NIRA to proclaim "the right to organize and bargain collectively" in exchange for the very large concessions that business gained under the act. In addition, labor was granted sections 7 (b) and (c), providing for the regulation of minimum wages and maxi mum working hours (to be fixed by collective bargaining agreements where these existed, and by industry codes where they did not), and prohibiting the employment of children. There was in fact considerable precedent for the principles enunciated in the NIRA. The desirability of collective bargaining had been endorsed by all twentieth century presidents of the United States (Taft and Ross, 387). As early as 1900, a collective bargaining arrangement was made between mine workers and owners in the bituminous coalfields, to be followed two years later by a similar agreement with the anthracite mine owners, under the prodding of their financier-backers and President Theodore Roosevelt (Lescohier and Brandeis, xiv-xv). The Railway Labor Act had provided similar protections to the Railway Brotherhoods in 1926. These earlier gains had, however, turned out to be ephemeral: collective bargaining in the coalfields did not last, and the Railway Labor Act turned out to be unenforceable in the face of resistance by the carriers. Even before Franklin Delano Roosevelt's inauguration, there were premonitions that sharp wage cuts and lengthening working hours would produce worker protests, as had often happened before. The first signs were spreading strikes in the textile mills and the mines, industries that had been depressed throughout the 1920s and then slumped further with the onset of bad times. It was, however, the inauguration of a president who promised to look to the forgotten man and the passage of legislation which promised to protect the forgotten industrial worker that gave the discontented an élan, a righteousness, that they had not had before. The impact on workers was electrifying. It was as if incipient struggles had now been crowned with an aura of what Rude called "natural justice." Felt grievances became public grievances; for the federal government itself had declared the workers' cause to be just. There is, for example, the story of a group of workers at the Philco radio plant who organized a Walking, Hunting, and Fishing Club under the leadership of a twenty-one year old named James Carey, and then went to the president of Philco to demand a contract, insisting the NIRA had made collective bargaining a matter of national policy. When the Philco official disagreed, the workers promptly climbed in a couple of old automobiles and went off to Washington, absolutely convinced they would be proven right. In industries that had already been organized, somnolent unions sprang to life. The ranks of the United Mine Workers had dwindled in the twenties as a result of the decade-long slump in the coal industry, and then were almost decimated by the depression. After passage of NIRA, John L. Lewis, head of the mine workers, moved into action, committing the entire UMW treasury and one hundred organizers. Sound trucks were dispatched into the coalfields blaring the message, "The President wants you to unionize." Bernstein quotes a UMW organizer in June 1933: "These people have been so starved out that they are flocking into the Union by the thousands. . . . I organized 9 Locals Tuesday" (1971, 37, 41-42). Within two months, UMW membership jumped from 60,000 to 300,000 (Thomas Brooks, 163; Levinson, 20-21), and paid-up memberships reached 528,685 in July 1934 (Derber, 8); the International Ladies Garment Workers Union quadrupled its membership, reaching 200,000 in 1934 (Derber, 9); the Amalgamated Clothing Workers, which had reported 7,000 dues-paying members at its low in 1932, added 125,000 new members (Bernstein, 1970, 335). And the Oil Field, Gas Well and Refinery Workers Union, which in 1933 claimed only 300 members in an industry employing 275,000, established 125 new locals by May 1934 (Bernstein, 1971, 109-111). "So in 1933 along came the New Deal, and then came the NRA, and the effect was electric all up and down those valleys. The mills began reopening somewhat, and the steel workers read in the news papers about this NRA section 7 (a) that guaranteed you the right to organize. That was true, and that's about as far as it went; you had the right to organize, but what happened after that was another matter. All over the country steel union locals sprang up spontaneously. These locals sprang up at Duquesne, Homestead and Braddock. You name the mill town and there was a Local there, carrying a name like the ÔBlue Eagle" or the "New Deal" Local. There was even an "FDR" Local, I think. These people had never had any experience with unionism. All they knew was that, by golly, the time had come when they could organize and the Government guaranteed them the right to organize (Lynd, 1969, 58)." But the guarantee was not to be kept. Interestingly enough, the first obstacles were created by the existing unions themselves, for their role at this stage was virtually to destroy the surge toward unionism among the mass of unorganized industrial workers. When the depression struck, the AFL was nearly half a century old. It had been formed in the 1880s as a federation of national craft unions, and its dominant leaders (aside from William Green, a former UMW official) were the presidents of the large craft unions: Bill Hutcheson, boss of 300,000 carpenters, who had once hired strikebreakers to preserve his rule; Dan Tobin, $20,000-a-year president of the teamsters; John Frey, aging head of the aging molders; Matthew Woll, of the photoengravers. The membership of the AFL reached a peak of about 5 million in 1920, when the unions could claim to represent 17 percent of the American work force (Mills, 53), then fell off during the depression of 1921, and stood still during the apparent prosperity of the twenties. The oligarchs, their positions well-secured, were not much perturbed. At the turn of the century the AFL had become closely allied with the National Civic Federation, representing the big financiers and businessmen who sought a "reasonable" cooperation of labor and capital. During the l this rapprochement with industry became virtually complete. Matthew Woll, an AFL vice-president, became the acting president of the National Civic Federation, and the AFL reversed its historic Opposition to scientific management, resolved that increases in wages Should be linked to increases in productivity, stressed union-management cooperation, and undertook a campaign to purge communist' influences in its member unions. Strike activities virtually ceased. Meanwhile, the mass of industrial workers remained unorganized. With the depression, however, union membership sank to a new low of 2,126,000 or about 9 percent of the work force, and at first the clamor of rank-and-file industrial workers begging for unionization seemed to arouse the enthusiasm of the AFL leadership president William Green described section 7(a) as a "Magna Charta" for labor and boasted that membership would reach 10 million, and then 25 million. The AFL slogan would be, he proclaimed, "Organize the Unorganized in the Mass Production Industries." But this was not to happen, and there were several reasons why. One was the predominance in the AFL structure of the large craft unions, for whom jurisdictional preoccupations were paramount. The workers, who, with good faith and enthusiasm, were rushing to join unions, were assigned to what were called federal locals in the AFL structure. In the second half of 1933, after the passage of the NIRA, the AFL received 1,205 applications for federal local charters and granted 1,006 (Bernstein, 1971, 355). In deference to the jurisdictional claims of the craft unions, these locals were considered temporary bodies, and were denied voting rights in AFL councils (although the dues of the federal locals went far toward supporting the central AFL organs, for they were not siphoned off by the big affiliated unions). Moreover, ostensibly because they were organized on a plant basis and not by craft, it was understood that the members of federal locals would ultimately be divided up among the craft unions who staked out their jurisdictional claims, some times splitting the newly organized workers in a factory among as many as fifteen or twenty different unions, with the result that they were hopelessly divided among competing organizations and in capable of action. Whatever the difficulties it caused, the effort of the big craft unions to claim the new unionists for themselves was natural enough. But even this was done half-heartedly; to the oligarchs of the AFL, the new members spelled trouble. These leaders maintained their preeminent on the basis of the members whose allegiance they claimed and on whose apathy they could count. It was one thing to boast of organizing ten million of the unorganized, but quite another to welcome masses of unsettling newcomers either into existing organizations made secure by stasis, or even worse, into new and competitive unions within the AFL structure. In October 1933 a convention of the AFL Metal Trades Department denounced the AFL leadership for chartering federal unions, asserting that "this condition, if allowed to continue, will completely demoralize, if not actually destroy, the various international unions' charter and jurisdictional rights" (Levinson, 54). Moreover, the oligarchs were accustomed not only to internal stability, but to external conciliation, and the signs of militancy among the unorganized suggested a mode of conflict that had become distasteful to many of the AFL leaders. Bill Collins, an AFL representative, sent to win the auto workers to the AFL banner in the face of a trend toward independent unionism, told the auto manufacturers, "I never voted for a strike in my life" (Fine, 69). Finally, there was the age-old contempt for the unskilled, which served to justify the organizational preoccupations of the AFL leadership. Collins is said to have confided to Norman Thomas, "My wife can always tell from the smell of my clothes what breed of foreigners I've been hanging out with" (Levinson, 60). Tobin, leader of the teamsters, wrote during the crest of the NIRA agitations: "The scramble for admittance to the union is on. We do not want to charter the riff-raff or good-for nothings, or those for whom we cannot make wages or conditions. . . . We do not want the men today if they are going on strike tomorrow (Levinson, 13-14). The actions of Michael F. Tighe, president of the Amalgamated Association of Iron, Steel, and Tin Workers, representing in 1933 some 50,000 skilled men in a steel industry employing some half million workers, are an example. Tighe had helped to break the 1919 steel strike by signing an agreement for his handful of skilled Workers while the bulk of the steel workers were still out on strike. Now, as men rushed to join his union, he seemed at first more confused than anything else, then condemned the walkouts by new unionists at two steel works, denounced a committee set up by the rank and file to organize strike machinery, and finally simply expelled 75 percent of his new members. Meanwhile, to show his good intentions, Tighe sent a letter to the steel mill owners asking them to lend an ear to the workers asking for recognition, assuring them he had "only one purpose, that of advancing the interests of both employer and employee." The letter was not answered (Levinson, 68-72). By the summer of 1935, Tighe reported a total membership of 8,600 in the entire steel industry. Similarly, the new rubber unions, concentrated in Akron, found their members divided between nineteen craft locals (Schlesinger, 1958, 355). Demoralized, their membership fell from a peak of about 70,000 in 1934 to 22,000. The ranks of the auto unions shrank from an estimated 100,000 to 20,000, or 5 percent of the more than 400,000 workers in the industry. The United Textile Workers of America, having reached a membership of 300,000 in the summer of 1934, claimed only 79,200 members by August 1935. The Union of Mine, Mill, and Smelter Workers, a descendant of the militant Western Federation of Miners, had gained 49,000 recruits under a new young leadership. With no AFL organizers in sight, they called a strike in May 1934 and 6,600 men walked out at the Anaconda Copper Mine Company in Butte and Great Falls. The AFL Buildings and Metal Trades Department arrived on the scene and negotiated a settlement for 600 craftsmen, soon to be divided among sixteen craft unions, and the strike was scuttled (Bernstein, 1971, 106-109). By summer 1935, membership in the Mine, Mill, and Smelter Workers was down to 14,000 (Levinson, 78). After a debacle at the AFL convention in the fall of 1935 over the issue of the industrial unionism, John L. Lewis and several other union leaders withdrew to form the Committee for Industrial Organization, later to split with the AFL and declare itself the Congress of Industrial Organizations. It included the small federal auto and rubber worker locals which had reluctantly been granted industrial charters by the AFL in 1934, but charters so hedged in as to protect the claims of the craft unions and the authority of the AFL leader ship. Like the AFL, the CIO leaders announced they would "encourage and promote organization of the workers in the mass-production and unorganized industries of the nation" (Levinson, 119). What they would do, however, still remained to be seen. Men and women had flocked to the unions, to the promise of labor power through organization. They had handed over the high dues that the AFL demanded of its federal locals and then found themselves confused by the jurisdictional tangles their leaders imposed on them, and discouraged by the moderation and conciliation their leaders demanded of them. At this stage, organization failed, and perhaps for that reason, the workers' movement grew. Whatever the reluctance the AFL leadership showed in dealing with the mass of unorganized industrial workers, they at least applauded the promises the NIRA made to labor. Employers took a different view. They had allowed the promises to be made grudgingly, in return for the concessions that the NIRA provided to business, and they had no intention of seeing the promises fulfilled. The less controversial of the legislative concessions to labor had been the provisions governing wages and hours but, since employers dominated the code authorities that fixed minimum wages and maxi mum hours for each industry, these provisions were also the more easily undermined in practice. Some codes simply neglected to mention minimum wages. Where the codes did specify wages and hours, particular manufacturers easily gained exemptions by pointing out the peculiar conditions obtaining in their industry or business, while others used the "stretch-out" to evade standards. Nevertheless, there were some improvements overall after the passage of the legislation and the establishment of the National Recovery Administration; average hours of labor per week declined from 43.3 to 37.8, and average annual earnings in manufacturing, mining, and construction increased from $874 in 1933 to $1,068 in 1935 (Raybeck, 332). From the outset industry had viewed section 7 (a), which presumably gave workers the right to organize and bargain collectively, as the more serious threat, and industry leaders moved quickly to emasculate the provision. Some corporations flatly prohibited unionization; many more began to set up "employee representation" plane. These plans, or company unions, had become popular in the 1920s and by 1928 an estimated 1.5 million workers were included (Pelling, 146). But between 1933 and 1935, new company plans proliferated. As the demand for unionization escalated despite these devices, companies began to maintain blacklists and simply fired known union members by the thousands, despite the ostensible protections afforded by section 7 (a) and increasingly, in the face of the upsurge of worker militancy, employers resorted to the techniques of violence and espionage, to barbed-wire fences and sandbag fortifications, to well armed and well-financed "Citizen Associations," to special deputies and the massive use of labor spies. Subsequent testimony before a subcommittee of the Senate Committee on Education and Labor, chaired by Senator La Follette, indicated that American industry had hired 3,781 labor spies between 1933-1937 (Raybeck, 344); the cost of anti-union agents in 1936 alone was put at $80 million (Thomas Brooks, 164). If industry leaders were not satisfied with the compromises of the New Deal, neither were the rank and file of labor. The right to organize and join a union had given the workers hope, and unleashed their discontent. But unionization had so far been a failed cause, resisted by employers, fumbled by AFL leaders, and worn away in government procedures that led nowhere. The number of unionized workers again plummeted to a historic low by 1935, accounting for only 9.5 percent of the labor force (Mills, 53). However, while union membership was falling, worker militancy was rising. During the spring and summer of 1934 strikes spread and, as they escaped the control of established union leaders, became more unpredictable. Three times as many workers struck in 1933 after NIRA as in 1932; the number of industrial disputes reported by the U. S. Bureau of Labor Statistics rose from 841 in 1932 to 1,695 in 1933, and then to 1,856 in 1934 when a million and a half workers were involved in strikes (Millis and Montgomery, 692, 700-701). With employer resistance also mounting, many of the strikes culminated in large-scale battles. The first of these was the "Battle of Toledo." Toledo had been devastated by the depression. Its main plant was Willys-Overland, which produced 42,000 cars in March 1929 and employed 28,000 people. In a matter of months, production was cut back; by spring of 1932, Willys employed only 3,000 people (Keeran, 63). Meanwhile the auto parts industry in Toledo was also hard hit, with the result that unemployment in the city was high, and the wages of those still working were below the NIRA code minimum. Early in 1934, demands for union recognition at the Electric Auto-Lite Company and several smaller firms were rejected, and 4,000 workers walked out. The workers returned to the plants after federal officials secured a commitment from the employers to "set up a machinery" for negotiations. But Auto-Lite then refused to negotiate, and a second strike was called on April 11. Only a minority of the workers joined the walkout this time, however, and the company determined to keep its plant open, hiring strikebreakers to reach full production. Toledo was a stronghold of A. J. Muste's radical Unemployed Leagues, and the Musteites rapidly mobilized large numbers of unemployed workers to reinforce the picket lines. On April 17 the company responded by obtaining a court order limiting picketing and prohibiting league members from picketing altogether. But the Musteites decided to violate the restraining order, and some local Communists joined in with the slogan "Smash the Injunction by Mass Picketing" (Keeran, 168). A handful of militants then began picketing. They were quickly arrested, but upon their release, they returned to the picket lines, their numbers now enlarged by workers emboldened by the militants' example. More arrests and further court injunctions seemed to only galvanize the strikers, and the numbers of people on the picket lines grew larger day by day. Sympathy for the strikers in Toledo was such that the sheriff could not use the local police to protect the strikebreakers and instead deputized special police, paid for by Auto-Lite. By May 23, the crowd massed outside the plant had grown to some 10,000 people, effectively imprisoning the 1,500 strikebreakers inside the factory. The sheriff then decided to take the initiative, and the deputies attacked. The crowd fought back, several people were seriously wounded, and a contingent of the Ohio National Guard was called in. Armed with machine guns and bayoneted rifles, the Guardsmen marched into the Auto-Lite plant in the quiet of dawn and succeeded in evacuating the strikebreaking workers. But the next day, the crowd gathered again, advanced on the Guardsmen, showering them with bricks and bottles. On the third advance, the Guard fired into the crowd, killing two and wounding many more. The crowd still did not disperse. Four more companies of Guards men were called up, and Auto-Lite agreed to close the plant. Then, with the threat of a general strike in the air, the employers finally agreed to federal mediation which resulted in a 22 percent wage increase and limited recognition for the union. The next scene of battle was Minneapolis. The city had always been a stronghold of the open shop, vigilantly enforced by an employers' "Citizens' Alliance" formed in 1908 to prevent unionization by means of stool pigeons, espionage, propaganda, and thugs. During 1933, when a third of the work force in Minneapolis was unemployed and the wages of those still working had been cut, a handful of local Trotskyist militants; members of the Socialist Workers Party gained control of Teamsters Local 574 and began to sign workers up. After an initial victory in the coal yards, the local began to organize the truck drivers and helpers. But Minneapolis business men, alerted by worker agitation elsewhere in the country, were prepared for a showdown. When Local 574 presented its demands to the trucking employers, the Citizens' Alliance stepped in and promised to smash the strike. The union's demands were summarily rejected. Mediation efforts by the Regional Labor Board were fruitless and, on May 15, 1934, the strike was on. The alliance promptly swore in 155 "special officers," prompting workers in Minneapolis to rally behind the truck drivers, many of them by going on strike them selves. Both sides established military headquarters and armed their men. Pickets roved through the city in bands, some on motorcycles, seeing to it that no trucks moved. On May 21, after the police threatened to move trucks, the first battle broke out between the two armies. Thirty of the vastly outnumbered police were injured in the hand-to-hand fighting that ensued. The next day, a crowd of 20,000 gathered, fighting broke out again, and two special deputies were killed, some fifty wounded. With workers virtually in control of the city, and with the first families of Minneapolis in panic, the sense of impending class war grew. In San Francisco, longshoremen encouraged by section 7(a) were flocking into the International Longshoremen's Association. Their special grievance was the "shape-up" hiring system which left them at the mercy of the foremen, never able to count on a day's work. But the ILA leaders made no effort to challenge the shape-up, and a rank-and-file movement developed, led by a small caucus of Communists and other radicals, including Harry Bridges. At a meeting in February 1934 the rank and file forced union officials to demand a union hiring hail or threaten to strike in two weeks. Roosevelt had been warned that the waterfront bosses wanted a showdown, that any money they might lose in a dock strike would be more than worth it if the union was destroyed (Schlesinger, 1958, 390). A federal mediating team worked out a compromise that provided some degree of union recognition, but did not give the union control of the hiring hall. Joseph Ryan, president of the ILA, accepted. But local leaders, pressed by the rank and file, spurned the plan, and the strike was on. "In solid ranks, eight to ten abreast, thousands of strike sympathizers. - Tramp-tramp-tramp. No noise except that. The band with its muffled drums and somber music. . . . On the marchers came- hour after hour-ten, twenty, thirty thousand of them. . . . A solid river of men and women who believed they had a grievance and who were expressing their resentment in this gigantic demonstration (Charles C. Norris, quoted by Bernstein, 1971, 281-282)." In the up-swell of anger and sympathy, the momentum for a general strike grew. By July 12 some twenty unions had voted to strike, and Hugh Johnson announced a "civil war" in San Francisco. But the strike folded after four days, undermined by the local AFL Central Labor Council that had been forced to take on the leader ship of a general strike of which it wanted no part. Once the general strike collapsed, the longshoremen had no choice but to accept arbitration, with the result that hiring hails jointly operated by the union and employers were established. In the interim William Green of the AFL had himself denounced the San Francisco general strike (Brecher, 154-157). The textile strike that erupted across the nation in the summer of 1934 took on the character of a crusade as "flying squadrons" of men and women marched from one southern mill town to another, calling out the workers from the mills to join the strike. By September, 375,000 textile workers were on strike. Employers imported armed guards who, together with the National Guard, kept the mills open in Alabama, Mississippi, Georgia, and the Carolinas (Bernstein, 1971, 298-311). Before it was over, the head of a local union in Alabama had been shot, his aides beaten; Governor Talmadge of Georgia declared martial law and set up a detention camp for an estimated 2,000 strikers; fifteen strikers were killed, six of them when the sheriff's deputies clashed with a flying squadron in Honea Path, South Carolina; riots broke out in Rhode Island, Connecticut, and Massachusetts and National Guardsmen were on duty across New England; and the trade journal Fibre and Fabric pontificated that "a few hundred funerals will have a quieting influence." During that same summer, deputies killed two strikers and injured thirty others when the Kohier Company in the "model" company town of Kohler Village, Wisconsin, refused to bargain with the union (Taft and Ross, 352). All in all, a minimum of fifteen strikers were killed in 1933, and at least forty more were killed in 1934. In a period of eighteen months, troops had been called out in sixteen states (Levinson, 56-57). As worker demands escalated, industry resistance escalated to match, and each side repeatedly called on federal authorities to mediate. At first, the policy of conciliating business prevailed, but conciliation grew more and more difficult as workers became more militant. The automobile industry is an example. Before the NIRA went into effect, there was virtually no union organization among automobile workers. After the NIRA, workers joined the AFL federal locals, independent unions began to appear, and a series of strikes broke out in the summer of 1933. Meanwhile, the National Industrial Recovery Administration had, as in other industries, ceded the initiative in formulating automobile codes to the owners of the industry. The National Automobile Chamber of Commerce in effect became the auto industry code authority (Levinson, 57). The wages and hours code which auto industrialists submitted and which the president signed called for hourly rates ranging between forty- one and forty-three cents and a work week ranging from thirty-five to forty-eight hours, but labor leaders claimed those standards were widely violated. The provision designed by the industry to demonstrate observance of section 7 (a) came to be known as the "merit clause." It specified that "employers in this industry may exercise their right to select, retain, or advance employees on the basis of individual merit, without regard to their membership or non-membership in any organization" (Levinson, 57-58). Under this clause companies began to discharge unionists in the fall of 1933. At the same time General Motors rushed through a series of company union elections and announced that it would not recognize or enter into a contract with any independent union on behalf of its employees. Each time the code was extended in December 1933, in September 1934, and in February 1935 labor leaders protested vehemently, but to little avail, excepting that the president appointed a labor advisory board and also ordered a survey of wages and unemployment in the automobile industry. Agitation among the auto workers continued. In March 1934, when workers in several GM plants were threatening to strike, President Roosevelt called industry and labor representatives to a meeting at the White House. The resulting peace agreement established the principle of proportional representation. Employees in a plant would be divided among company unions and various independent unions for collective bargaining purposes. Roosevelt called the plan "the framework for a new structure of industrial relations"; the president of General Motors, Alfred P. Sloan, said, "All's well that ends well"; and William Green concurred, heralding a labor Victory. But experience suggested that it was a plan for dividing Workers against each other. The New York Times correspondent wrote that "organized labor's drive for a greater equality of bargaining power with industry has been nullified." Similar stratagems were followed in the textile industry. Codes governing wages and hours were undermined by stretch outs that greatly increased the workload. Despite the supposed protections of Section 7(a), thousands of unionists were fired, and the Cotton National Textile Industrial Relations Board disposed of worker Complaints simply by referring them to the industry's Textile Institute. Meanwhile the NRA sanctioned an industry-wide cut in production which reduced employment and wages still further. The inevitable strike was temporarily averted when the NRA promised a survey and a seat on the Textile Board for the United Textile Workers. When the strike finally erupted in the summer of 1934 the president intervened by appointing a new Textile Labor Relations Board to study workloads in the industry, while the Department of Labor would survey wages, and the Federal Trade Commission would assess the capacity of the industry to increase hours and employment (Brecher, 176). United Textile Workers leaders called off the walk out, claiming a victory. The strikers returned to the mills only to find that thousands of their numbers were barred from reemployment and evicted from their company houses by the mill owners. In the steel industry, the National Labor Board, pressed by strikes in Weirton and Clairton, finally ordered an, employee election but the employers refused to abide by the order. When handed the case, the Department of Justice refused to act. Later, when the companies were laying in supplies of tear gas, bullets, and sub machine guns to defend against unionists, rank and filers went to Washington to see the president, who was away on a cruise. This time the workers rejected the offer of the NRA chief, General Hugh Johnson (who proposed the appointment of a board to hear their grievances), and instead wrote the president that they thought it "useless to waste any more time in Washington on the "National Run Around'" (Levinson, 70). But while the federal government was conciliating businessmen through this period, it was also showing an unprecedented concern and restraint in dealing with labor. "To an extraordinary extent at this time," writes Bernstein, "the laboring people of the United States looked to the federal government and especially to Roosevelt for leadership and comfort" (1971, 170). In the uncertain climate of the time, however, labor support could not simply be taken for granted. Accordingly, Roosevelt attempted to appease demands by workers; even the unfilled promises and evasive studies of the NRA were an effort at appeasement and a sharp contrast with the court injunctions and federal troops of an earlier era. As complaints from labor leaders over violations of 7 (a) became more bitter, the National Labor Board was established to settle employer-worker disputes. Senator Robert F. Wagner, an ally of labor, was appointed chairman and the NLB became an advocate of the right to organize and of the principle of collective bargaining. Despite some initial successes, the NLB lacked legal authority and could do nothing when employers simply defied it, as happened in several major cases in late 1933. In February 1934 the NLB, which had been authorized mainly to hold discussions, was empowered to conduct employee elections and, later in 1934, a resolution sponsored by Wagner led to the reorganization of the board into the National Labor Relations Board. None of these changes proved very effective in the face of employer resistance, particularly since the Department of Justice showed considerable reluctance to prosecute cases referred to it by the board. Even in election cases, where the NLRB had clear authority, employers delayed compliance and stalled in the courts. By March 1935 none of the cases referred to the Department of Justice had resulted in a judgment (Bernstein, 1971, 320-322). But with industrial war escalating, the policies of conciliating business while placating labor could not last. The administration could not ignore the battles that were raging between industry and labor, if only because industrial peace was essential for recovery. And once entangled, it could not take sides without alienating one camp or the other. When strikes and riots broke out in the coal mines con trolled by the steel companies (known as the "captive" mines) in the summer of 1933, Hugh Johnson forced a settlement to which Lewis agreed but which the miners themselves rejected. The steel industry and the UMW were soon locked in conflict, the New York Times reported 100,000 miners on strike, and negotiations under the auspices of the NRA were leading nowhere. With coke stocks dangerously low, the steel executives finally insisted on the president's intervention. But whatever they expected from this intervention, the resulting agreement hardly pleased them. In fact, none of the corporations abided by its terms until the disputes were referred to the NLB, with the result that a "modified collective bargaining agreement was reached in many of the captive mines (Bernstein, 1971, 49-61). Nor could the administration stay aloof from the battles of 1934 in Toledo, Minneapolis, and San Francisco, in which the business Community was stiffly opposed to worker demands, and to federal proposals for settlement. Once involved, federal arbitrators, faced with unprecedented labor uprisings, did not side with the workers, but they did not side with employers either. That was enough to prove the undoing of the policy of business conciliation. Although most businessmen had supported Hoover in 1932, at least some prominent leaders among them had endorsed Roosevelt, and others quickly joined when Roosevelt reopened the banks, cut government spending, and legalized beer within a month of taking office. As for the NIRA, the U. S. Chamber of Commerce itself had endorsed "the philosophy of a planned economy" before the election, and in 1933 its delegates gave Roosevelt a standing Ovation. Mean while, at least partly thanks to the privileges granted industry under the NIRA codes, overall business conditions were improving. By the spring of 1934 the index of industrial production had picked up sharply, particularly in industries covered by the codes. Industry leaders regained their confidence and, as they did, became increasingly disgruntled with the turmoil set in motion in their own house by the New Deal labor policy. Just prior to the congressional elections of 1934 a group of major business leaders, including Alfred P. Sloan and William S. Knudsen of General Motors, Edward F. Hut ton and Colby M. Chester of General Foods, J. Howard Pew of Sun Oil, Sewell L. Avery of Montgomery Ward, and the DuPonts, joined with several political leaders who had been dethroned by the New Deal to form the American Liberty League, an organization dedicated to protecting property rights from the "radicalism" of the New Deal (Schlesinger, 1958, 486). Roosevelt's policy of conciliation notwithstanding, business had thrown down the gauntlet. But the election of 1934 was a New Deal sweep, bringing the Democratic margin to 45 in the Senate, and to 219 in the House, "the most overwhelming victory," the New York Times declared, "in the history of American politics." "No man was less bound by ideology in approaching national problems. The strategy he adopted some time in 1935, devised with the collaboration of Edward J. Flynn, was to gather into the Democratic Party many minorities, including the labor unions, through policies calculated to win the urban masses, while he held the farmers in line with cash benefits (559)." Roosevelt and his advisors had originally thought of labor concessions primarily in terms of unemployment relief and insurance, old age pensions, and wages and hours protections (Bernstein, 1971, 11). But rank-and-file agitation set new terms, and the terms would have to be met if labor was to be kept in line. By 1935, with worker-employer battles mounting, it was clear that conciliation had failed. The administration had lost business support and, if worker demands went unappeased, it stood in danger of losing some labor support as well. In the spring of 1935 the NIRA and the president were being denounced by all sides. "Labor's public enemy Number One is Franklin D. Roosevelt," said Heywood Broun. The Supreme Court brought matters to a head on May 27, 1935, for it declared the NIRA unconstitutional, thus scuttling the New Deal's chief economic program. With even that protection gone, unemployment increased, wages dropped, and hours lengthened (Raybeck, 341). And the election of 1936 was on the horizon. "He invariably failed to support labor legislation actively until he was convinced it had adequate political support, and he some times sabotaged pro-labor policies already declared to be the law because of strong business pressure. . . . Always fairly sure the country would follow him on relief and recovery measures, he vacillated longest on long-range reform, for business and the middle class were most hostile here. Because he deliberately cultivated contacts with the whole gamut of group interests, he knew better than his predecessors what was politically expedient and what timing was indicated (182)." A year later the timing was right, and labor agitation had helped make it so. When Wagner introduced a revised version of the bill that was to become the National Labor Relations Act, the measure found ready support. Since labor's right to organize had long been upheld in principle, proponents of the bill had little difficulty finding arguments, adding only that the bill was important as a means of achieving economic balance by preserving purchasing power, and as a bulwark against communism. With few exceptions, the business community continued to be vehement in its opposition, and the National Association of Manufacturers mobilized one of its largest campaigns to defeat the measure. The Commercial and Financial Chronicle called it "one of the most objectionable, as well as one of the most revolutionary, pieces of legislation ever presented to Congress" (Schlesinger, 1958, 404). The AFL remained aloof, as did the administration; Secretary of Labor Perkins, the only administration representative to testify, was ambivalent (Bernstein, 1971, 331). On May 2, 1935, the Senate Labor Committee reported unanimously in favor of the bill; the vote in the Senate was 63 to 12. Several weeks later, it passed the House by an overwhelming 132 to 42. Roosevelt, who until this time had kept silent, finally came out in favor of the bill and signed it on July 5, 1935. But the fight was not over. Two weeks after the bill became law, the American Liberty League published a brief signed by fifty eight lawyers declaring the Wagner Act unconstitutional. Industry then acted on the assumption that the law need not be obeyed and U. S. Steel, General Motors, and Goodyear Tire and Rubber rushed to the federal courts where they got injunctions that tied the hands of the new National Labor Relations Board; by June 30, 1936, the board was involved in eighty-three such suits (Bernstein, 1971, 646). Moreover, there was reason to think employers would be vindicated by the Supreme Court. During 1935 and 1936 the Court had nullified other major elements of the New Deal program, including the National Industrial Recovery Act. In 1936 the Court struck down the Guffey-Snyder Act, which laid down procedures for the coal industry very much like those of the Wagner Act. American industry had grounds for optimism. American workers, however, were also optimistic. The passage of the Wagner Act, at a time when working conditions were worsening after the temporary recovery of 1934, only reaffirmed for them the jus of their struggle and their sense that victories could be won. Congress had acted despite the threats and importuning of the leading industrialists of the nation. Moreover the defeat of many of those same industrialists in the election of 1934 was repeated in the election of 1936 when, despite the vigorous opposition of business interests, the New Deal won an overwhelming sweep. Workers probably understood that for the moment, at least, business had lost control of the state. Consequently, labor militancy surged in 1936 and 1937, especially in the mass production industries. The number of strikes continued to rise: 2,014 in 1935; 2,172 in 1936, and 4,740 in 1937. And more than half of the strikes were over the demand for union recognition under the terms laid out in the Wagner Act (Millis and Montgomery, 692, 701). The first big strike after the Wagner Act occurred in Akron. The background for the strike was familiar. Akron was a one-industry town where employment had fallen by half after the stock market crash. By the spring of 1933 many of the rubber companies had shut down, Goodyear was on a two- day week, the main bank had failed, and the city was broke, laying off many of its own employees (Bernstein, 1971, 98-99). Then came section 7(a), setting the rubber Workers in motion. Federal locals were formed, and some forty to fifty thousand workers joined up, all of whom AFL leaders tried to parcel out among the international craft unions. At the end of 1934 the NLRB ordered elections in the Goodyear and Firestone plants, but the companies went to court and the issue was delayed indefinitely (Brecher, 179). The workers were pressing for a strike, but their union leaders signed a federally mediated agreement to await the outcome of the court action and Goodyear announced that the agreement made "no change in employee relations since the provisions are in complete accord with the policies under which Goodyear has always operated" (Brecher, 180). Discouraged by AFL and government maneuverings, men dropped out of the union. But the workers' discontent did not dwindle, especially when in November 1935, and again in January 1936, Goodyear Tire and Rubber cut wages. Then, on February 10, the company laid off a large number of men without giving the usual notice. A few nights later, 137 workers, hardly any of them union members, shut off the power and sat down. Local Rubber Worker Union officials persuaded the sit-downers to leave, but 1,500 Goodyear workers met and voted to strike (Brecher, 183-184). The word went out, workers began to gather in the bitter cold and by morning the eleven-mile perimeter of the Goodyear plant was circled by pickets. Few of the ten to fifteen thousand who struck were members of the union, but the factory was at a standstill. Meanwhile, the picketers were digging in, building over 300 shanties for protection against the winter winds, from which they flew American flags, again named for the promise: "Camp Roosevelt," "Camp John L. Lewis," "Camp Senator Wagner." Goodyear succeeded in getting a sweeping injunction against mass picketing from the common pleas court in Summit County, but the injunction was not enforced. When the sheriff threatened to open the plant with a force of 150 deputies, thousands of workers armed with clubs and sticks massed before the gates and the deputies with drew. Later the rumor spread that a "Law and Order League" would attack the picket lines, but the rubber workers armed again, and the threat never materialized. Goodyear then turned to Governor Davey for troops, but a state election was approaching, popular sentiment in Akron was with the strikers, and the Akron Central Labor Union declared there would be a general strike if force was used. The governor agreed there was no justification for calling out the militia. At the end of February Assistant Secretary of Labor McGrady arrived on the scene to mediate. He recommended that the strikers return to work and submit the issues to arbitration. Some 4,000 workers met at the armory and jeered the proposal down, singing Out "No, no, a thousand times no" (Bernstein, 1971, 595). In the fourth week of the strike Goodyear Tire and Rubber agreed to a settlement that granted reinstatement of the discharged employees, reduction of the work week, and recognition of union shop committees (Levirison, 143-146; Thomas Brooks, l81-182). The next outbreak was in the automobile industry, in the giant industrial empire of General Motors, controlled by the DuPonts and J. P. Morgan. GM had always stood firmly and successfully against unionism, partly by virtue of an elaborate program of "welfare capitalism" inaugurated during the upsurge of union activity following World War I. With the onset of the Great Depression, the welfare programs eroded, and after 1933 GM relied more on a vast spy network in its plants to discourage union activities. According to the La Follette Committee, GM was the best customer of the labor spy agencies, and its expenditure for espionage rose as unionization activities increased (Fine, 37), totaling at least a million dollars between January 1934 and June 1936 (Walsh, 109). "Briggs Manufacturing Company hired me as a metal finisher at 52 cents an hour, but they failed to pay me at that rate. The first week I got 45 cents an hour. The second week our rate was cut to 40 cents an hour, and the third week it was cut to 35 cents. These wage cuts were enough to provoke the men to strike. After being called to work on Sunday, they walked out at noon without telling the foreman. On Monday we went to work again, and before starting work we told the foreman: "We want to know what out- wages are. We were hired at 52 cents an hour, and we're being paid 35 cents." The foreman said: "You see that line out there of men looking for jobs? If you fellows don't want to work, get your clothes and clear out. There are plenty of men who will take your jobs." "This statement provoked the men into walking out as a body, not as individuals. They had no organization; they had no one to speak for them. There were several hundred of them milling around in the street wondering what to do. . . . I got on a car fender and suggested we demand the 52 cents an hour promised on our hiring slips. . . . I was blacklisted as a result of the strike . . . [ I learned that as a result of the strike the wages of metal finishers had been raised to 60 cents art hour (Lynd, 1969, 62-63)." After the passage of section 7 (a), auto workers had begun to join unions. Many of them had joined the AFL federal union (later to become the United Automobile Workers and to affiliate with the CIO). But, under the constraining effects of AFL policies and government conciliation of the auto industry, total union member ship had rapidly declined, to only 5 percent of the workers in the industry by early 1935. Still, unionized or not, with the passage of the Wagner Act, the landslide New Deal victory in the election of 1936, and the successes of the rubber workers in Akron, the auto workers' courage rose and ferment increased. By the fall and winter of 1936 each minor offense by management fell like whiplashes on aggrieved men chafing for action. There is the story, for example, of an early sit-down in Flint that was triggered when a union man who protested a firing was led through the plant by a foreman, apparently to be discharged. As he walked the length of the belt-line, his face communicated the message, and every worker turned from the moving row of auto bodies until 700 men were idle. The company rehired the discharged man before work was resumed (Levinson, 175). Brief walkouts and sit-downs at the Chrysler Corporation, at the Bendix plant in South Bend, and at the Midland Steel and the Kelsey-Hayes plants in Detroit ended with some degree of union recognition. In this mood, the struggle with General Motors was bound to come. Although the fledgling United Automobile Workers, by now affiliated with the CIO, had assigned Wyndham Mortimer, a Communist rank-and-file leader from Cleveland, to begin an organizing campaign in Flint some months earlier, the GM strike actually began relatively spontaneously, erupting in different places at about thee same time. Several outbreaks at the Atlanta GM plant culminated in a strike on November 18, 1936, when the rumor spread that management intended to lay off several men for wearing union buttons. A few weeks later the workers at a GM Chevrolet plant in Kansas City walked out after the management had allegedly dismissed a man for violating a company rule against jumping over the line. On December 28 a small group of workers sat down on the line in the GM Fisher Body plant in Cleveland, and 7,000 people stopped working. Then, on December 30, about 50 workers sat down in the Fisher Body plant in Flint, presumably because of a management decision to transfer three inspectors who had refused to quit the union. That night the workers in a second and larger body plant in Flint also sat down on the line, and the Flint sit-down strike was on at a time when the union could claim as members only a small minority of Flint workers. The strike spread to other cities. Sit- downers took over the GM Fleetwood and Cadillac plants in Detroit, and a lamp factory in Indiana; walkout strikes were called in St. Louis, Janesville, Norwood, Kansas City, and Toledo. By January 1, 1937, 112,000 of GM's production workers were idle. Flint, the main battleground of the strike, was the center of the GM empire, and a GM town. The corporation controlled about 80 percent of the jobs. GM's upper crust was the town's upper crust and most of the political officials were former GM employees or stockholders. Accordingly, when company guards tried to bar the strike supporters from delivering food to the men inside the plant, they were quickly reinforced by Flint police and a battle ensued. The police used tear gas and guns, the strikers returned their fire with streams of water from GM fire hoses, and with automobile hinges, bottles, and rocks. About two dozen strikers and policemen were injured in what came to be known as the "Battle of the Running Bulls." The disorder precipitated the intervention of the Governor of Michigan, Frank Murphy, who had been elected to office in the Roosevelt landslide of the previous November. He had received the endorsement of the entire Michigan labor movement, although he was also on close terms with auto industry executives, and was later revealed to have substantial GM holdings (Brecher, 200). Governor Murphy sent word to GM officials not to deny food or heat to the strikers in the interest of public health, and arrived on the scene with about 2,000 National Guardsmen who, however, were instructed not to take sides. The governor then assumed the role of peace maker, prevailing on the UAW leaders and General Motors officials to negotiate. But the negotiations proved futile, the workers evacuated three minor plants only to discover that GM had also agreed to negotiate with the Flint Alliance, a citizens' vigilante organization dominated by the corporation. By mid-January, Secretary of Labor Frances Perkins was importuning GM executives to meet with union representatives. The corporation was losing about $2 million a day in sales, but it nevertheless held fast, refusing to meet with the union until the plants were vacated. On January 27 GM announced that it intended to resume production, and went to court for an injunction against the sit-downers. The strikers responded by occupying yet another plant in a dramatically covert maneuver, leading President Roosevelt to phone John L. Lewis with the message that he backed a plan calling for GM recognition of UAW for one month. Lewis is said to have replied, "My people tell me it's got to be six months," and the sit-down continued. "We have carried on a stay-in strike for over a month in order to make General Motors Corporation obey the law and engage in collective bargaining. . . . Unarmed as we are, the introduction of militia, sheriffs, or police with murderous weapons will mean a blood bath of unarmed workers. . . . We have decided to stay in the plant. We have no illusions about the sacrifices which this decision will entail. We fully expect that if a violent effort is made to oust us, many of us will be killed, and we take this means of making it known to our wives, to our children, to the people of Michigan that if this result follows from the attempt to eject us, you are the one who must be held responsible for our deaths (Levinson, 164-165)." The spirit of the message from the sit-down strikers was the spirit of many workers outside the plants as well. On the morning of February 3, as the Guardsmen set up their machine guns and howitzers, the roads to Flint were jammed with thousands of trucks and automobiles, supporters of the strikers from surrounding cities who had come to join the picket lines. Rubber workers came from Akron; auto workers from Lansing, Toledo, and Pontiac; Walter Reuther brought several hundred men from his West Side local in Detroit; Workers came from the Kelsey-Hayes plant in Detroit carrying a banner: "Kelsey-Hayes never forgets their friends." As the hour of the court order approached, a procession of perhaps 10,000 workers, led by Women's Emergency Brigades carrying an American flag, circled the menaced plant. The marchers carried clubs and sticks, lengths of pipe, and clothes trees for the battle they expected. Thus the deadline passed. The crisis had reached the point where the White House was compelled to intervene in seriousness. At Roosevelt's request, and coaxed by the Secretary of Labor, corporation executives met with CIO and auto union leaders, and in the agreement that resulted, the union won a six-month period of what amounted to exclusive recognition in the seventeen plants closed by strikes. A similar sequence of events occurred in the Chrysler plants only a few short weeks after the GM strike was settled. (The overwhelming majority of Chrysler workers had voted in favor of an "employee representation" plan only two years earlier.) When discussions between Chrysler and UAW leaders bogged down, 60,000 workers struck; two-thirds of them by sitting down in Chrysler factories. The strikers held the plants for thirty days, defending their occupation with massive picketing. An attempt by the local sheriff to en force a court order for evacuation of the plants was responded to by 30,000 to 50,000 massed strikers who encircled the plants. An agreement was finally signed with Chrysler early in April. Within a year, the UAW claimed 350,000 members (Walsh, 126-133). "Well, we got interested in the union . . . because the steel mill people came into the mill around 1933 and handed us a piece of paper. We looked at it, and it was called "An Employee Representation Plan." . . . I looked at this paper as a young lad and said this thing could never work, because it said right at the outset that there would be five members from management to sit on a committee and five members from the union-the company union to sit on the committee. I asked who settled the tie, and of course I found out the management did. . . . We tried to disband the company union, and we formed what we called the Associated Employees. This was just workers like myself attempting to do something by way of getting into a legitimate union. . . . One day we read in the newspapers that they were trying to do the same thing down in Pittsburgh (Lynd, 1969, 55-57)." Signs of restlessness within the company union structure became clear early in 1935 when employee representatives in the Pittsburgh and Chicago area plants began agitating for wage increases, an issue that was not considered to be within the jurisdiction of the employee representation plans, or even of the individual plant managers, who claimed that wages were a matter of overall corporation policy. As a result, company union representatives from different plants began to meet together to consider joint actions (Brooks, Robert, 85-89). In January 1936 thirteen out of twenty-five employee representatives in the Gary, Indiana, plant of Carnegie-Illinois Steel formed a union lodge. In Pittsburgh (where workers were especially angry about a 10 percent check-off being taken from their wages by Carnegie Illinois as repayment for relief baskets) some twenty-five employee representatives met to set up a Pittsburgh central council to make district-wide demands on wages and hours issues through the company unions. "They fired our foreman, a nice fellow, and they brought over a slave driver from Gary. A white fellow told us he was an organizer for the Ku Klux Klan and said: "You all going to stand for that guy to come in here?" So I went down to the operators of the pickles and said: "Shut the pickles down." And they shut them down. I went over to see Long, the foreman, and I said: "Long, you lost your job . . . give me five minutes and we'll make them tell you where your job's at I drove over to the hot strip where the white fellows were rolling hot steel, and I said: "Hey, fellows, just stop a minute rolling that steel. We're shutting down over there. We're fighting for ten cents an hour and our foreman back on the job." (It would look foolish fighting for your foreman and not for yourself.) And they said: "Oh, you got it organized?" And I said, "Yes, we shut it down. Look over there, we're down, we're not moving. So the white fellows said: "We'll follow you" (Lynd, 1969, 60-67)." On July 5, 1936, steel workers congregated in Homestead, Pennsylvania, to honor the Homestead martyrs and to hear a "Steel Workers Declaration of Independence," read by an erstwhile company union leader. Lieutenant Governor Kennedy of Pennsylvania, a former miner and officer of the UMW, told the crowd that steel was now open territory for union organizers and that they could count on government relief funds if there was a strike; a far cry from the treatment strikers received in Homestead during earlier struggles (Walsh, 49). Later that summer, Governor Earle told a Labor Day crowd of 200,000 assembled in Pittsburgh that never during his administration would the state troops be used to break a strike and "the skies returned the crowd's response" (Walsh, 171). It was in this context that the CIO launched the Steel Workers Organizing Committee, putting 433 organizers into the field and suspending the customary dues and initiation fees to sign men up (Bernstein, 1971, 452-453). In November 1936, when the SWOC announced that 82,315 men had signed membership cards, U. S. Steel responded by announcing a 10 percent wage hike, and offering con tracts to be signed only by the company unions. But many of the company union leaders had been drawn into the SWOC and refused to sign, while Secretary of Labor Perkins said that the leaders of the Employee Representation Plans "had no right to sign contracts." By March 1937 when SWOC had established 150 locals with 100,000 members (Raybeck, 351) and the company unions were wrecked, U. S. Steel signed with the union, without a strike. There were probably several reasons for the easy victory. GM had capitulated only a few weeks earlier, after its production had ground to a complete halt, and U. S. Steel must have been worried by e losses a strike would cause at a time when the prospects of a war in Europe had created a booming demand for steel. Worker agitation in the steel mills was interfering with production just when US Steel was negotiating vast contracts for armaments with the British, who were insisting on a guarantee of uninterrupted production. Unionism was a way to offer that guarantee, as Myron Taylor, head of U. S. Steel, had learned from the agreement signed in the captive mines in 1933 (Walsh, 73). It was also clear that U. S. Steel would get little political support in a showdown. Governor Earle of Pennsylvania, elected by a labor-liberal coalition, had promised the steel workers his backing. And on Capitol Hill, criticism of the steel industry for its espionage activities and its price fixing practices was growing. Finally, unlike the men who headed other steel companies, Myron Taylor was not a steel man, but had been installed by the financiers who dominated his board, and he appeared to have the flexibility and sophistication to respond to new conditions with new methods. Unionization quickly followed in U. S. Steel's subsidiaries, and in some other independent steel companies. By May 1937 SWOC membership had reached 300,000 and over a hundred contracts had been signed (Raybeck, 351). "A mobilization of men, money and munitions occurred which has not been approached in the history of labor disputes in recent times. Although known to be incomplete, the committee has assembled data showing that a total of 7,000 men were directly employed as guards, patrolmen, deputy sheriffs, National Guardsmen, city police and company police on strike, duty. Over $4,000,000 was expended directly attributable to the strike. A total of $141,000 worth of industrial munitions was assembled for use." As in the Flint sit-downs, the workers looked to the president for help, but on June 30, 1937, the press quoted Roosevelt's response: "A plague on both your houses." In mid-July the strike was lost. It was the last of the depression battles, and spelled the end of an era. But while the Little Steel strike was lost in the mills, the movement of which it was a part produced the political concessions that were later to force union recognition by government tribunal. "When they tie the can to a union man, sit down! Sit down! When they give him the sack, they'll take him back, sit down! Sit down! When the speed up comes, just twiddle your thumbs, sit down! Sit down! When the boss won't talk, don't take a walk, sit down! Sit down!" "You'd be sitting in the office any March day of 1937, and the phone would ring and the voice at the other end would say, "My name is Mary Jones; I'm a soda clerk at Liggett's; we've thrown the manager out and we've got the keys. What do we do now?" And you'd hurry over to the company to negotiate and over there they'd say, "I think it's the height of irresponsibility to call a strike before you've even asked for a contract," and all you could answer was, "You're so right" (Thomas Brooks, 180)." By the fall of 1937, there were cases of operators in projection booths of movie theaters who locked themselves in and stopped the shows until their demands were met (Levinson, 173-175). Still more workers took part in walkout strikes. Before 1937 was over, nearly two million workers had engaged in labor struggles in that year alone (Millis and Montgomery, 692), more than half of them to secure union recognition. The strikes that spread through the country in 1936 and 1937 were victorious as economic struggles, but they were victorious only because a century-long accommodation between government and economic elites had been broken. The workers' movement had exerted sufficient political force to protect the economic force of the strike. The rubber workers in Akron, the auto workers in Flint, the steel workers in Pennsylvania all had been able to overcome employer resistance only because governors dependent on the support of aroused workers were reluctant to send troops against strikers. And in Youngstown and Chicago, where state and local governments were hostile, the Little Steel strike was lost, the workers' economic power once more destroyed by government firepower. Despite a new dive in the economy in 1937, the Department of Labor reported that wages of rubber workers increased by one-third over 1934, with the greatest increases in the lower wage brackets; the six-hour day was established in many rubber plants. The SWOC won wage increases in steel that led to an industry-wide minimum of five dollars a day, and the industry's wage bill increased by one-third over 1929. In the auto industry, workers won a seventy-five cents-an-hour minimum and a forty-hour week. Maritime workers were earning a peak wage of $72.50 a month. Overall, in October 1937, Philip Murray estimated a billion dollars had been added in wages: $250 million in steel; $100 million in automobiles; about $60 million in textiles; $6 million in transport; and $12 million in electrical appliances. Nearly a million workers had won a 35 or 36 hour week (Levinson, 260-277). The political impact of rising worker agitation was also evident in the concessions wrung directly from government. Federal regulation of wages and hours had been an issue since the abortive NIRA codes, and had figured again in the 1936 election campaign. Late in 1937, after a new dive in the economy, Roosevelt began to push hard for a wages and hours bill (which the AFL continued to oppose). When the House Rules Committee, dominated by southern congress men who had good reason to worry about the impact of minimum wage legislation in the South, prevented the measure from coming up for a vote in the regular session, Roosevelt called Congress back for a special session. Finally in January 1938 the Fair Labor Standards Act became law, affecting some 300,000 workers who were earning less than the twenty-five-cents-an-hour minimum, and some 1,300,000 workers whose official work week was over the forty-four- hour standard established by the law (Raybeck, 360). The new depression of 1937-1938 helped prompt several other measures to ease and appease labor, most importantly an increase in activity by the Public Works Administration, an expansion of the work relief rolls, the introduction of the federal public housing program, and a step-up of the due date for the first social security payments from 1942 to 1939. But of all these measures, it was the Wagner Act and federal sup port of unionization that was most important in shaping the workers' political future. After business broke with Roosevelt in 1935 the president not only lent his support to the act, but appointed pro-labor members to the NLRB. Then in April 1937, several months before the debacle of the Little Steel strike, the Supreme Court handed down its decision upholding the Wagner Act in National Labor Relations Board vs. Jones and Laughlin Steel Company. With that decision, the protection of government for the right of labor to organize and to bargain collectively was reaffirmed. The Wagner Act not only placed the ultimate authority of the state behind the right of workers to join unions and bargain collectively, it also established a series of mechanisms through which that authority was enforced. With the passage of the act, therefore, it was government as much as the unions that organized workers, a point to which we will return shortly. Moreover, as our account up to flow should make evident, the unions could not take much credit for the uprisings that forced government to act to protect unionization either. In the minds of most people, worker struggles are usually linked with unionism; the right to join a union and to bargain collectively was often a central demand in worker uprisings long before the 1930s but that does not mean that established unions played a central role in these uprisings. In fact some of the fiercest struggles in the nineteenth and early twentieth centuries occurred when the unions were weakest and sometimes despite the resistance of established union leadership. But while existing unions could not often be credited with the great worker struggles of the pre-depression years, there were nevertheless organizers in these struggles. Some of these organizers were insurgents from the rank and file; others were radicals whose vision of an alternative future helped to account for their exemplary courage. Wherever these organizers came from, their vision helped goad workers into protest, and their courage gave workers heart and determination. In the struggles of the 1930s, a similar pattern emerged. Many of the workers' battles were mounted to win union recognition. But neither the battles nor the victories were the result of existing union organization or union leadership. In fact the rising number of strikes after 1934 paralleled the decline in union membership as the AFL scuttled its own federal unions. Thus the battles in Toledo, Minneapolis, and San Francisco occurred either in the aftermath of failed unionization drives, or before unionization had taken hold. The textile strike of 1934 erupted among the rank and file after union leadership had settled with the industry, and later the United Textile Workers disclaimed any responsibility for the "flying squadrons" through which the strike had spread (Brecher, 169). The massive walkout of rubber workers at Goodyear in 1936 occurred when the United Rubber Workers had shrunk to a weak and small union; four days after the strike had begun, URW officials were still claiming it was not their affair (Brecher, 184). Later, when 15,000 men were on strike, the CIO sent organizers, funds, and negotiators. Bernstein writes that these experienced unionists guided the bar gaining and restrained the "mountaineers' natural tendency to violence" (1971, 595). But it was the mountaineers' willingness to use violence in the face of violence that won the strike. After the abortive experiences with the AFL during 1933 and 1934, only a tiny percentage of auto workers had joined the newly named United Automobile Workers. When the sit-downs began in 1936, the leaders of the new union were not quite in control of the wave of strikes that shook the industry. Homer Martin, the president of the UAW, was reportedly nonplussed when it became clear that the strike in the Atlanta GM plant was spreading and the union was faced with a GM strike. John L. Lewis, who had by this time broken with the AFL and established the Committee of Industrial Organizations, is said to have tried to head off the sit-downs, and CIO spokesman Charles Howard had told the 1936 UAW convention that the CIO was "not even considering the possibility of a strike in the auto industry, as we preach industrial peace" (Keeran, 126). Ac cording to J. Raymond Walsh, later research and education director for the CIO, "The CIO high command, preoccupied with the drive in steel, tried in vain to prevent the strike." (112). Once the sit-downs started, the CIO leaders came quickly after, rushing to catch up with and capture the spontaneous outbreaks of angry men and their local leaders. The vast ambition and keen instincts that had led Lewis to sense the opportunity for organizing industrial workers also led him to support the sit-downs once they had occurred, and to take over the negotiations with GM leaders. "I became president of the Associated Employees, and then we heard about a man named John Lewis who was very interested in trying to organize the unorganized. I wrote him a letter and said we had an independent union that would like to join up. He wrote back and told me if I held my short tail in he'd be down there in the near future and he'd send a man by the name of Philip Murray (Lynd, 1969, 57-58)." "Without a contract; without any agreement with the company; without any regulations concerning hours of work, conditions of work, or wages, a tremendous surge took place. We talk of a rank-and-file movement: the beginning of union organization was the best type of rank-and-file movement you could think of. John L. Lewis sent in a few organizers, but there were no organizers at Youngstown Sheet and Tube. The union organizers were essentially workers in the mill who were so disgusted with their conditions and so ready for a change that they took the union into their own hands. . . . For example, as a result of the enthusiasm of the people in the mill, you had a series of strikes, wildcats, shut-downs, slow-downs; anything working people could think of to secure for themselves what they decided they had to have (Lynd, 1969, 74)." "The workers were waiting for CIO, pounding on its doors long before CIO was ready for them. I heard the pounding as soon as I started with CIO late in 1 delegation, on the phone, in the mail, in the news. It came from within the AFL, and from all the unorganized industries. .. . We heard from auto and rubber workers, seamen; from radio, electrical, shipyard, furniture, textile, steel, lumber workers; from gas, coke, glass and quarry workers; from sharecroppers, newspapermen. . . . All said "CIO, let's go!" (226)." Who, then, was mobilizing men and women in the plants and the shipyards and the shops to say "CIO, let's go"? In many industries rank-and-file organizers emerged, apparently thrust naturally into leadership by the sheer force of the workers' movement. In a number of industries, these rank-and-file leaders were also ideological radicals, socialists of one variety or another, whose militancy owed some of its fervor to their larger commitment to societal transformation, and to the moral and tangible support they received from like radicals. In many strikes radicals who were not workers also joined in by providing a variety of supportive services to the strikers. Thus members of the old Industrial Workers of the World were active in some of the early auto strikes in 1933. In 1934, Musteites and Communists took the lead in encouraging strikers in Toledo to defy the courts. Trotskyists led the mobilization of striking teamsters in Minneapolis; and Communists and other radical rank-and- file longshoremen spurred the San Francisco dock strike, while a Communist-dominated Maritime Workers Industrial Union helped to spread the walkout. Of all the radical groups, the Communists are generally agreed to have been the most influential, and they were clearly an instigating force in the automobile and maritime industries, where small Communist nuclei served as key centers of agitation and mobilization. It may be useful, therefore, to pause to understand the role of the Communists, and how they came to play it. The Communist Party entered the depression after a decade of isolation and decline. At the beginning of the 1920s the party had established the Trade Union Educational League, dedicated to working within AFL unions to build industrial union organizations. During this period the Communists were virtually alone in their support of several desperation strikes in textiles and in mining. "Through the painful isolation of the twenties," writes Paul Buhle, "the Communists had tried first one formula, then another, in their attempts to reach the masses" (193). By the end of the decade the series of failures and a campaign of Communist expulsions by the AFL coincided with a change in Comintern policy, leading the party to adopt a new strategy of establishing independent (or "dual") unions. The Trade Union Educational League was reconstituted as the Trade Union Unity League in 1928, and some of the bitter early strikes of the depression were led by Communists affiliated with TUUL. As early as 1928 the scattering of Communists in the auto industry, perhaps only two or three in a factory, began publishing shop papers named the Ford Worker, Packard Worker, Hudson Worker, and the Fisher Body Worker (Prickett, 110), and otherwise pressed to build the Auto Workers Union, now affiliated with TUUL. "It was a slow, difficult, unglamorous task. A meeting called after the wage cuts in the Briggs Waterloo plant drew only two workers. A week later, a second meeting was held with only four workers. They decided to organize first around a single grievance; the practice of having men work two lathes. . . . The small nucleus of workers continued to meet and regularly distributed small leaflets which were passed hand-to-hand inside the plant (Prickett, 122)." The Communists worked with the mainly defensive auto strikes of this period, but they did not lead them and, as one party leader said at the time, they "did not really get a foothold in the factories." The rise of worker defiance after the passage of the NIRA created a new opportunity for the Communists. Workers were angry and hopeful; eager for action, and rank-and-file Communists helped them to act. As the unionization drive gained momentum during 1934 and 1935 the party, determined to work within the union movement, abandoned dual unionism, softened its criticism of the AFL, and Communists within the plants downplayed the party's political line in favor of an emphasis on workplace grievances. At this stage, the Communists approached the issue of unionism as agitators from below, trying to goad the workers on by exposing the compromises of the New Deal and of the AFL leadership, insisting that if workers were to win concessions, they had to rely "on mass action and not upon the promises of the NRA and high paid officials" (quoted in Keeran, 124). During this period, in other words, the Communists worked to build the movement, to stimulate anger and to encourage defiance. Because they worked to build the movement, the movement yielded the Communists some influence, at least while the defiant upsurge among the ranks continued. 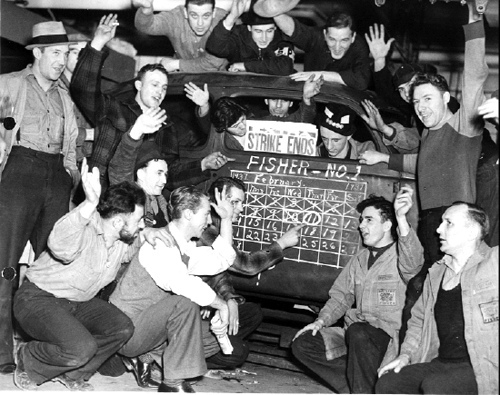 Keeran reports, for example, that before the GM strike a nucleus at the Cleveland Fisher Body shop had a dozen or so members, but then the nucleus grew to fifty (244). The persistence and determination of the Communists during the years of isolation and defeat before the depression were now being redeemed. But the workers, and the Communists, were fighting for unionization, and it was the CIO that emerged the victor from the struggle. It was Lewis' genius to sense the unrest of the time and to move to capture and lead it, willingly sweeping in the Communist organizers whose discipline and fervor were helping to build his organization. John L. Lewis and the Congress of Industrial Organizations did not create the strike movement of industrial workers; it was the strike movement that created the CIO. In the longer run it did this mainly by forcing the federal government to protect unionization by law, and to enforce that protection administratively. To a large extent it was the National Labor Relations Board established under the Wagner Act that organized the member unions of the CIO. To an even greater extent it was the NLRB that kept the CIO unions organized in the face of the forces that had eroded Union membership during earlier periods. The NLRB built and protected union membership in several ways. It effectively eliminated the use of such employer weapons as yellow dog contracts, labor spies, and even antiunion propaganda. It required employers to bargain collectively with the elected representatives of a majority of the workers. And it provided a government mechanism for conducting the actual elections. During earlier periods union organization had depended on continual efforts by organizers to maintain the affiliation of workers. These efforts, difficult at best, were doomed when employers could easily replace workers. But the NLRB changed that, for it "put the coercive power of government to extort union recognition from their employers at the disposal of employees" (Greenstone, 47). In 1938 the board in effect reversed the defeat in Little Steel, ordering the reinstatement of strikers, the elimination of company unions, and forbidding anti-union activities by the steel corporations (Bern stein, 1971, 727-728). Altogether in its first five years the NLRB handled nearly 30,000 cases, settling 2,161 strikes, and holding 5,954 elections and card checks in which two million workers voted (Bern stein, 1971, 652-653). By 1945 the board had handled 74,000 cases involving unfair labor practices and employee representation issues, and had held 24,000 elections to determine collective bargaining agents for six million workers (Raybeck, 345). As a result union membership grew. By the end of 1937 the CIO could claim 32 affiliated national and international unions, including the giant mass production unions in steel, autos, coal, and rubber. In addition it had chartered 600 local industrial unions, and 80 state and city central councils. Membership had grown from less than a million in December 1936 to 3,700,000. Meanwhile, the AFL also prospered, sometimes because employers rushed to sign up with an AFL union in order to ward off the more militant CIO membership in affiliated AFL unions rose to about equal that of the CIO. Just as quickly, the organizational apparatus of the unions expanded; by 1937 the CIO had established a network of forty-eight regional offices staffed by several hundred field representatives (Levinson, 275; Bernstein, 1971, 684). The spirit generated by mass strikes had helped build the industrial unions. The disruptive political force exerted by mass strikes had compelled the federal government to establish a framework that would protect the unions over time. But once established, the unions in turn did not promote disruption, either in economic or in political spheres. To the contrary, the unions undertook from the outset to maintain internal discipline in the factories in exchange for recognition. This in fact was their trump card in bargaining with management at a time when spontaneous work stoppages were plaguing industry. Thus the principal GM negotiator at the end of the Flint sit-downs complained bitterly that there had been eighteen sit-downs in GM plants in the previous twenty days. The agreement that GM signed with the UAW obligated the union to ensure that there would be no work stoppages until an elaborate grievance procedure had been exhausted, and UAW officials had given their approval (Fine, 305, 825). The CIO had never actually endorsed sit-downs, but with recognition it disavowed them. The Communists, by now well into their Popular Front phase and some of them into the union bureaucracy as well, endorsed the call for union discipline. Wyndham Mortimer issued a statement early in 1937 saying: "Sit-down strikes should be resorted to only when absolutely necessary" (Keeran, 294). And the Flint Auto Worker, edited by Communist Henry Kraus, editorialized that "the problem is not to foster strikes and labor trouble. The union can only grow on the basis of established procedure and collective bargaining" (Keeran, 294). Accordingly both the GM and the U. S. Steel contracts signed later in 1937 prohibited local strikes (DeCaux, xv). "There was a tremendous restlessness among the workers in the company plants. Countless complaints kept piling up. Spontaneous stop pages more the rule than the exception. This was poor business for a company which had always operated on the principle that its "contented" work force meant steady production and a steady flow of profits. Swope and GE had to be aware that the old system of paternalism had broken down and that something was needed to take its place if production and profits were to be maximized, especially in tight depression conditions (83)." "Constant stoppages, sit-downs, slowdowns, and piled-up grievances plagued production, as workers became steadily more militant and aggressive. So much so that the company began to get rumblings of dissatisfaction from various plant managers, who favored reaching agreements with the union if only to get on with the business of production. Westinghouse top officers had miscalculated. While Swope's GE agreement with the union had instituted orderly grievance procedure, the Westinghouse foremen and managers were up to their necks in snarls (122)." "It made sense" Bernstein points out, "to negotiate with responsible union officials like John L. Lewis, rather than with desperate local groups" (1971, 468). "A fundamental purpose of the national labor policy first enunciated by the Wagner Act and confirmed by its subsequent amendments in the Taft-Hartley and Landrum-Griffin Acts was the substitution of orderly procedures for trials of combat. But in balancing the public interest in the peaceful settlement of industrial disputes with the freedom of labor and management to work out their problems in light of their needs and experience, the law did not outlaw the exercise of economic force. . . . However, this approval of the strike, the picket line, and the maintenance of hard bargaining lines by employers and unions was limited by the establishment of specified rules of conduct imposed on all parties (378-379)." "I never went on strike in my life, I never ordered anyone else to run a strike in my life, and I never had anything to do with a picket line. . . . In the final analysis, there is not a great deal of difference between the things I stand for and the things that the National Association of Manufacturers stands for (quoted in Georgakas and Surkin, 39)." In 1973 the United Steelworkers of America moved even further in the direction of labor-management cooperation by signing an accord with ten major steel firms committing the union not to strike, submitting issues to binding arbitration instead (New York Times, June 5, 1973). When the agreement was signed, the Steelworkers had in any case not struck in fourteen years, and during that time they had fallen from the highest paid industrial workers to fourteenth on the list (Bogdanich, 172). Other unions, including the Seafarers Union, followed suit, signing agreements to use third-party methods for resolving grievances in place of the strike. Whether, by agreeing to refrain from leading work stoppages between contracts, the unions actually succeeded in reducing disruptions of production is not immediately self-evident. Work stoppages occurred nevertheless. But the unions had undertaken the responsibility for trying to control the rank and file, standing as buffers between workers and management. In part, the unions did this by introducing some of the rituals of democratic representation into the workplace, rituals which tended to delegitimize worker defiance when it did occur. In part, the union's role as regulator was implemented through elaborate grievance procedures which were substituted for direct action; these procedures tended to divert and dilute anger more effectively than they secured redress. Union disciplinary procedures also reflected this regulatory role, for the unions now either sanctioned company punishments against workers, or, beginning in World War II, undertook themselves to punish the leaders of local wildcats. "With rare exceptions, unions have joined with employers in seeking relief from taxes and government regulations, or in asking Congress to provide other assistance, be it tariffs, money or whatever. The railroad brotherhoods have urged Congress to lend railroads more funds; the communications workers union worries about the antitrust action against AT & T; the steelworkers join industry in demanding tariffs or quotas on steel imports; the auto workers union supports the Big Three's arguments for delaying emission-control deadlines; in the trucking industry Teamsters' lobbyists are working effectively at state and national levels to obtain an easing of load limitations, or to find fuel for its carriers; the clothing and textile unions seek to protect their employees from the competition of "cheap foreign goods" (170)." "The automatic dues check-off system has removed the union entirely from any dependence on its membership. The huge treasuries, originally conceived to stockpile ammunition for class warfare, have put the unions in the banking, real estate, and insurance business (quoted in Georgakas and Surkin, 45)." "The notion of contract implies a recognition by the union of its responsibilities for the enforcement of the agreement, which some times placed even radical union leadership in the seemingly anomalous position of having to act against its own constituency, when the contract was violated by members of the rank and file. Thus, the price which the union had to pay for the benefits it received was to become part of the productive system itself. (297 ff)." Nor were those union leaders who were Communists immune from these influences, for as their organizational roles in the CIO developed, their politics became more ambiguous. Radical ideology was no defense against the imperatives created by organizational maintenance. The unions not only limited the disruptive force of workers in the factories, they limited their disruptive impact in electoral politics as well. Before we go on to explain this point, however, we have to tell something of the efforts of the unions to become a significant force in electoral politics. By the end of 1937 the labor unions had nearly eight million workers on their membership rolls, and membership continued to grow during the war years. If the organization of large numbers is what matters for power in electoral politics, then the labor unions ought to have been a substantial force from the outset and, as their membership grew; their influence ought to have grown. But this was not the case. The organizational phase of the industrial workers' movement began just as the turbulent phase was cresting. While in 1936 the new CIO had not yet enrolled the millions of members it was soon to gain, it still began life with the not inconsiderable membership of the mine workers' and the garment workers' unions. And, from the beginning, the CIO tried to use its organizational apparatus and membership to exert influence in Washington through conventional electoral politics. Prodded by the rise of business opposition to the New Deal, and the sharp decline in business campaign contributions, the CIO launched a massive campaign to reelect the president in 1936. Labor's Non-Partisan League was established as the vehicle of union efforts, and the league's workers, operating very much like a party campaign organization, going on the radio, staging rallies, passing out thousands of leaflets, and spending nearly a million dollars began to contact voters in the industrial states of New York, Pennsylvania, Illinois, and Ohio (Schlesinger, 1960, 594; Greenstone, 49). In New York City, needle-trades union leaders resigned from the Socialist Party to join with Communists in creating the American Labor Party, making it easier for leftists who were reluctant to vote the Democratic ticket to back the New Deal. Roosevelt polled some 270,000 votes in New York on the ALP ticket. Later, the ALP also led the campaign for the reelection of Fiorello LaGuardia as mayor (Raybeck, 357; Schlesinger, 1960, 594). Meanwhile, the constituent unions of the CIO contributed $770,000 to Roosevelt's campaign chest, most of it from the mine workers' treasury. The magnitude of this contribution is suggested by the fact that during the previous thirty years the AFL executive had contributed only $95,000 to national political campaigns (Pelting, 166). The election of 1936 was, of course, only the first step on the new course in pursuit of electoral influence. In 1938 the CIO lobby backed Roosevelt's Supreme Court reform, as well as an array of other New Deal legislative measures, and during the campaign the CIO distributed a bulletin called "How to Organize and Conduct a Local Political Campaign" (Greenstone, 49). Meanwhile Walter Reuther resigned from the Socialist Party to back Democrat Frank Murphy in the Michigan gubernatorial contest (Bernstein, 1971, 780). In 1940 John L. Lewis himself opposed Roosevelt, but the CIO nevertheless gave FDR its overwhelming support: union dele gates participated in the Democratic convention, and Roosevelt ran strongest in counties with high concentrations of CIO members. In fact the CIO's commitment to Democratic Party politics had already become so firm that Lewis' split with Roosevelt earned him nothing but the enmity of union leadership, and he resigned as president of the CIO. In 1943 the CIO expanded its investment in Democratic electoral politics with the creation of the Political Action Committee (PAC), which developed a sophisticated and well- financed campaign organization, in some places capable of canvas sing entire communities, from the precinct level up, operating in the primaries as well as the elections. Loyalty was the keynote: PAC discouraged its state units from challenging local Democratic parties in order to "weld together the unity of all forces who support the commander in chief behind a single progressive win-the-war candidate for each office" (quoted in Lichtenstein, 6l). PAC was widely credited with a crucial role in the Democratic victory of 1944, in which every CIO constituent union endorsed Roosevelt and the CIO spent some $1,328,000 (Pelting, 180). In 1948 the AFL followed the CIO lead by forming Labor's League for Political Education, which cooperated with PAC on campaign activities. With the merger of the AFL and the CIO in 1955 the Committee on Political Education (COPE) was established, and the investment of the unions in electoral politics and the Democratic Party continued to increase (Greenstone, 52-60). In other words the unions had succeeded in following the prescribed American model for political influence; they had enlisted ever larger numbers of workers as members, and had combined the financial and voting resources of those members to exert influence through the channels of the electoral system. The question is, what did they get for their troubles? "For six months the economic royalists represented by General Motors contributed their money and used their energy to drive this administration out of power. The administration asked labor for help and labor gave it. The same economic royalists now have their fangs in labor. The workers of this country expect the administration to help the workers in every legal way, and to support the workers in General Motors plants (quoted in Raybeck, 368)." Lewis' assessment was accurate; GM leaders were among Roosevelt's most vigorous opponents in the 1936 election. But his expectations were misplaced. When Roosevelt did finally intervene in the GM strike, it was reluctantly and cautiously. He intervened, not because he was politically beholden to union leadership, but because he was forced to do so by the escalating crisis in Flint. Again, in the Little Steel strike, when Roosevelt was reported to have called down "a plague on both your houses," Lewis claimed betrayal: "It ill be hooves one who has supped at Labor's table and who has been sheltered in Labor's house to curse with equal fervor and fine impartiality both Labor and its adversaries when they become locked in deadly embrace" (quoted in Raybeck, 368). But whatever lesson was to be learned was lost on CIO leaders (except perhaps for John L. Lewis himself). Although the investment of the unions in electoral politics increased, the ability of labor unions to protect the gains that had been won in the mid-1930s rapidly diminished. The strike wave had subsided by 1938, its momentum broken by the bitter defeat in Little Steel. Meanwhile business and government had begun a two-pronged assault on industrial unionism that was to culminate a decade later in the passage of the Taft-Hartley Act. One prong was the launching of a red-baiting campaign that severely weakened the unions internally by stimulating bitter factionalism and ultimately resulted in the purging of more militant Communist elements. The other prong was a campaign to limit the new protections won for unions under the Wagner Act. The red purge in the CIO that is ordinarily located in the post war McCarthy period actually began in 1938. It was merely interrupted by the war years, and then resumed vigorously in the late 1940s. The beginning of the campaign was signaled in 1938 by widely publicized hearings of the House Un-American Activities Committee under Chairman Martin Dies. John Frey testified and the New York Times headlined his message the next day: "Communists Rule the CIO, Frey of the AFL Testifies: He names 248 Reds" (Mattes and Higgins, 104-105; Prickett, 374). Meanwhile the CIO was assaulted by unfavorable press and radio commentary depicting the unions as violent and communistic, or at the very least, "irresponsible" (DeCaux, 29 1-292), while the National Association of Manufacturers financed the printing of two million copies of a pamphlet which depicted John L. Lewis holding a picket sign aloft that read, "Join the CIO and Build a Soviet America" (Matles and Higgins, 118). By 1939 the signs were clear that the political tide had turned and measures to erode the concessions that labor had won began to be implemented. Under pressure from southern Democrats and Re publicans in Congress, the NLRB was reconstituted to eliminate its pro-labor members; the Supreme Court ruled that sit-downs were illegal; and state legislatures began to pass laws prohibiting some kinds of strikes and secondary boycotts, limiting picketing, outlawing the closed shop, requiring the registration of unions, limiting the amount of dues unions could charge, and providing stiff jail terms for violations of the new offenses. By 1947 almost all of the states had passed legislation imposing at least some of these limitations. World War II did not interrupt the campaign to curb labor gains, but it greatly confused the issues by allowing government and industry to define questions of labor policy as questions of patriotism. In fact the policies of the Roosevelt Administration toward its staunch labor allies during the war years clearly revealed how much the influence of the rank and file had diminished. When war preparation began in earnest after the election of 1940, the demand for labor suddenly soared. This was a boom such as American workers had not seen for a long time. Within a few months the number of unemployed dropped from 10 million to 4 million, and wages began to rise, from an average $29.88 a week in 1940 to $38.62 in December 1941 (Raybeck, 371). A new wave of strikes swept the country as the unions tried to enlist the new workers and to take advantage of the rising demand for labor by pressing for higher wages. But the Roosevelt Administration acted rapidly to suppress the strikes. When UAW workers at the Vultee aircraft plant in Los Angeles struck two weeks after the 1940 presidential election, the FBI and the attorney general branded the strike "Red" and government agents descended upon the strikers, who nevertheless won most of their demands (Green, 8-9; Keeran, 333). Shortly afterwards UAW strikers shut down the Allis-Chalmers plant near Milwaukee; the local police and state militia were called out and Roosevelt threatened to seize the plant (Thomas Brooks, 195; Green, 9; Keeran, 334-336). When 20,000 CIO woodworkers went on strike in the northwest and decided not to return to work on terms dictated by the federal government, the press branded it a Communist strike (DeCaux, 396-397). When 12,000 UAW workers struck North American Aviation in Los Angeles, Roosevelt ordered some 3,000 troops to take over the plant, and the strike was broken (Green, 10; DeCaux, 398-399). In the fall of 1941 John L. Lewis, who had denounced Roosevelt bitterly for sending troops "to stab labor in the back," called a strike in the "captive" coal mines owned by the major steel companies. A federal mediation board ruled against the workers, but Lewis responded by calling out 250,000 other coal miners, and the strike was won. After the attack on Pearl Harbor, Roosevelt dealt with the in creased labor militancy by taking advantage of the upsurge of patriotic feeling to secure a no-strike pledge from the CIO and AFL. A War Labor Board was established to handle industrial disputes for the duration, and wages were to be set by the federal "little steel" formula in a program calling for "equality of sacrifice" of corporations, consumers, and workers. In fact, corporate profits zoomed, prices shot up, and wages lagged behind. By 1943 worker restive ness was scarcely controllable, and the number of wildcats escalated rapidly. But union leaders by and large kept their no-strike pledge, and the chairman of the War Labor Board called the policy an outstanding success. It was a success, for union officials were now themselves denouncing and containing the wildcats. Lewis and the miners bucked the trend. After rank-and-file walk outs early in 1943, Lewis demanded a two-dollar-a-day increase with no stretch-out or speed-up, and pay for time traveled underground. The mine owners refused to negotiate, the press screamed "traitor," Roosevelt threatened to use federal troops, but the miners nevertheless walked out. Reminded of the no-strike pledge, Lewis said it was not a strike, but that the miners would simply not trespass on company property if they had no contract. Roosevelt seized the mines, but the miners stayed out; he then demanded legislation that would permit the federal government to draft strikers, while Congress passed the Smith-Connally Act curbing strikes. When the miners finally went back to work, they had won most of their demands. But what they had won, they had won by force of their belligerency in the mines, and not by their influence in the White House or in the halls of Congress. Of the 219 Democratic congressmen who had voted for Smith-Connally, 191 had been supported by PAC. While efforts were made to muzzle strike power during the war, union leaders themselves were courted by government and industry, and the federal government continued to protect the ability of the unions to retain and enlarge their membership. This was not surprising, for the unions were performing a valuable service. A member of the War Labor Board commented on this issue: "By and large, the maintenance of a stable union membership and responsible union discipline makes for keeping faithfully tile terms of the contract, and provides a stable basis for union-management cooperation for more efficient production" (quoted in Brooks, Thomas, 203). As a result of the War Labor Board's "maintenance of membership" policies, union membership grew. By 1945, the CIO claimed 6 million members; the AFL claimed nearly 7 million. If ever there was a time for labor to demonstrate the force of organized voting numbers in electoral politics, a force no longer constrained by the imperatives of war and the spirit of patriotism, now was the time. As it turned out, the force of organized voting numbers could not even ward off the Taft-Hartley Act. With war contracts canceled and servicemen demobilized when the war ended in the summer of 1945, unemployment rose, wages declined as overtime was lost, and prices continued to rise, reducing real take-home wages to levels below the prewar period. An unprecedented wave of strikes ensued, this time under official union leadership. Virtually every major industry was shut down for some period during 1946. President Truman responded by using his war time powers, months after the end of the war, to seize oil refineries, railroads, mines, and packinghouses. When railroad workers struck anyway the president threatened to draft them and use the Army to run the railroads; when the miners struck, the government secured an injunction, and the UMW was fined $3.5 million for its defiance. "We used the weapons that we had at hand," Truman said afterwards, "in order to fight a rebellion against the governmentÉ" (quoted in Brecher, 229). Truman had proposed legislation to draft strikers, but the Congress responded with its own plan, the Taft-Hartley Bill, substantially modifying the "Wagner Act by specifying the rights of employers in industrial disputes and restricting the rights of unions. Elaborate requirements were imposed for the reporting of internal union procedures; non-communist affidavits were required of union officers on penalty of losing the services of the NLRB; the closed shop was outlawed, as was the union shop, except where authorized by the majority of workers in a special ballot (and even this provision did not apply where states had enacted "right-to-work" laws); the check-off of union dues by employers was declared illegal except by written permission of the employee; and various forms of secondary boycotts were prohibited. Finally, certain strikes were to be delayed by a mandated sixty-day cooling-off period; strikes against the federal government were prohibited altogether; and the president was given special powers to intervene to halt strikes for eighty days which endangered the "national health or safety" (Pelling, 189-191). Truman, with the 1948 elections ahead, vetoed the act. The Congress overrode the veto by a margin of 331 to 83 in the House, and 68 to 25 in the Senate, freeing Truman to use the legislation to curb strikes twelve times in the first year after its passage (Green, 34). While Taft- Hartley was being debated in the Congress, the Cold War was being created in the White House and with it the witch hunts and purges of leftists that further divided and weakened the CIO in the postwar years. Taft-Hartley went far beyond the wartime actions of the federal government. It not only curbed the strike power, but it curbed the unions' capacity to organize as well. Union membership declined in the years immediately following the passage of the act, and thereafter recovered only slowly, reaching 18.9 million in 1968. But as a percentage of the total work force, union membership was lower in 1968 than in 1947. In the nineteen "right-to-work" states where compulsory open shop legislation is permitted by Taft-Hartley, union membership averages only half the proportion in the other states. These are restrictions that the unions bitterly opposed at the time, and that they have continued to oppose in the thirty years since the act was passed, but without success. Our discussion has thus far emphasized the losses the unions sustained in the specific area of government labor policy. They fared no better in other areas of domestic policy that affected the conditions of working people: they did not succeed in expanding the gains wrested from government in the 1930s, and in some instances they did not even succeed in sustaining these gains. The list of labor's failures is long, but it self-evidently includes increasingly regressive federal income and corporate tax policies that help to erode whatever labor wins at the bargaining table; federal housing policies that have inflated the Cost of workers' housing and profited the construction industry; federal minimum wage standards that have not been raised to keep pace with real wages; the poor record of federal performance in the area of industrial safety; and a social security system that bears more and more heavily on workers because of the extremely regressive formula by which it is financed. This dismal overall record in electoral and legislative politics was accomplished by the largest issue-oriented voting bloc in the nation. In the decade between the Wagner Act that signified labor's political muscle, and the Taft-Hartley Act that signified its helplessness, the ranks of organized labor had increased until one-third of the population was union affiliated. During that decade the unions' organizational apparatus had also enlarged and become increasingly sophisticated and increasingly committed to electoral politics on all levels. But neither this vast bloc of voters nor the sophisticated machinery of their organization could muster power sufficient even to resist the erosion of the gains won earlier, in the days before the unions had organized. Why? The answer is twofold. In part, it was that in the absence of a movement, the unions were not really capable of delivering the voting bloc they claimed to represent. The strike movement of the 1930s, by contrast, threatened to mobilize workers as voters in a way that overrode the usual multiple appeals of party, section, and ethnicity. While the labor vote had shifted to the Democratic column in the election of 1932, that vote was still insecure, and the industrial struggles waged by workers made it more insecure. The strike movement threatened electoral disruption. But once the movement subsided, it was the Democratic Party, not the unions that gained the ability to command the allegiance of working-class voters and name the issues for which allegiance would be traded. In the absence of the extraordinary fervor provoked by a mass protest, the unions played at best a subsidiary role in disciplining the working-class vote. Moreover, there is substantial evidence that the unions really did not try to use the pressure their voting members represented to force mass concessions from electoral leaders. Union leaders became more dependent on the Democratic Party (for prominence, not con cessions) than the party was on them. Acting accordingly, union leaders promoted partisan allegiance, and by doing so, blunted the electoral impact of worker discontent. The unions became the legitimate political voice of industrial workers, and that legitimate voice spoke out repeatedly against strikers, and in support of Democratic leaders. Thus during the war years, worker discontent did not diminish. The war boom strike wave of 1941, and the wildcats of 1943, were each successively larger than the other, and larger than the strike wave of 1937. But discontented workers exerted little electoral force, and the less so because their own leaders supported the national government's policies. When the CIO woodworkers struck in 1941, Philip Murray, who had taken Lewis' place as head of the CIO, denounced the woodworkers' leadership, echoed press charges of communism, and demanded that the strike be called off (DeCaux, 397). When the UAW workers struck North American Aviation the same year, UAW's Aviation Director Richard Frankensteen called the strike "communist-inspired" on national radio, and later addressed a meeting of strikers to order them back to work. It was after the Workers booed Frankensteen and ignored his order that Roosevelt called out the troops (Green, 10), apparently' with the approval of Sidney Hillman (Keeran, 340). When Roosevelt seized the mines during the 1943 UMW strike to break the "little steel" formula, the executive board of the CIO repudiated Lewis and the UMW, and congratulated Roosevelt for his veto of the Smith-Connally Act despite the fact that the legislation reflected Roosevelt's own public proposals. In other words even when the unions failed to curb economic disruptions by workers, they succeeded in muting the electoral impact of those disruptions. The circumstances which led to the uprisings of industrial workers, and gave them force, were rooted in the economic and social dislocations of the depression. Catastrophic unemployment and the sharp decline of wages made workers restive in the first place; the early moves by political elites to deal with the economic catastrophe, and with the electoral instability bred by catastrophe, only legitimized worker discontents, helping to escalate an industrial war. Still the federal government temporized, trying to appease both business and labor. But workers, seized by the spirit of the movement, refused to be appeased and, with industrial disorder increasing, the federal government's policy failed. The disgruntled business community deserted the Democratic Party, clearing the way for concessions to labor. Then, with the workers' movement still unabated, and with violence by employers escalating, reluctant political leaders finally chose sides and supported labor's demands. The disruptive tactics of the labor movement had left them no other choice. They could not ignore disruptions so threatening to economic recovery and to electoral stability, and they could not repress the strikers, for while a majority of the electorate did not support the strikers, a substantial proportion did, and many others would have reacted unpredictably to the serious bloodshed that repression would have necessitated. And so government conceded the strikers' main demand, the right to organize. It is not likely that the worker agitations of the 1930s would have broken out under more stable economic conditions, and it is not likely that they would have had the force they did under more stable political conditions. In other words it required the widespread dislocations of a deep depression for the workers' movement to emerge, and to give it disruptive force in electoral spheres. Such times are rare and certainly not of anyone's deliberate making. Moreover disruptive political strategies, even during the infrequent periods when they are possible, are unpredictable and costly. The workers of the 1930s had no guidelines on which to rely and from which to gain assurance and protection, for their struggles defic3 the conventions of political influence and thereby also eschewed the protections afforded by these conventions. The workers paid heavily for their defiance, in thousands arrested, hundreds injured, and many killed. But then, they also won. That industrial workers did in fact win in the 1930s, and that they won only through mass struggle, is underplayed in some radical interpretations. Such interpretations emphasize the advantages that unionization ultimately yielded management and seem therefore to imply that collective bargaining arrangements were yielded by an employers' conspiracy. It is clearly true that management came in time to find unions useful, perhaps because the unions helped to discipline workers and maintain production and more certainly because they helped to depoliticize worker discontent when it did erupt. Moreover in some industries, such as electrical manufacturing, unionization promised to stabilize wages and thus reduce the uncertainty of corporate competition (Schatz, 188-189). But for the most part, these were advantages that industrialists themselves recognized slowly at best and only under extreme duress. They granted union recognition after bitter resistance; they granted it only in the face of mass strikes and government coercion. In effect, industrialists learned to use unions after the workers had fought for and won them. Industrial unionization was not a management strategy but a workers' victory. And the victory was worth winning. Clearly, the straightforward concessions in higher pay and shorter hours and in government social welfare measures offered up at the height of the turmoil of the 1930s were worth winning. The more ambiguous concession was the right to organize itself. But, on balance, unionization must also be considered a gain for industrial workers simply because they have been better off with it than they were without it; they are better off in the 1970s than they were in the 1920s. They are better off because unions still lead strikes; they still use some disruptive leverage, and because they do, most workers in the mass production industries have held their own in economic spheres. Wages have kept pace with rising productivity and profits. Moreover, through unionization, workers gained a measure of job security. In particular, workers are now protected against reprisals in union-led strikes. On the other hand, unionization also ritualizes and encapsulates the strike power, thus limiting its disruptive impact on production, and limiting the political reverberations of economic disruptions as well. And the unions themselves have never exerted direct influence in electoral spheres comparable to the electoral influence of the workers' movement of the 1930s. Industrial workers are by any measure the exemplary case of mass- based permanent organization. No other stratum of the lower class has comparable opportunities for organization on so large a scale. The main reason is that no other group possesses comparable disruptive power. Labor won from elites the resources necessary to sustain a mass organization precisely because the enormous disruptive power of the strike had to be contained. Having been ceded the right to organize, including especially the legal sanction to coerce workers into union affiliation-labor could solve its organizational maintenance problem; through coerced affiliation, a mass base has been successfully sustained. But what other group in the lower class has the disruptive power to enable it to win equivalent resources for organizational maintenance? Industrial workers are also tile exemplary case by which to test beliefs about tile effectiveness of mass-based organization in electoral spheres. Through organization, labor ostensibly commanded vast re sources for political influence: millions of organized voters and multi- million-dollar treasuries from dues. Still, these resources yielded them little in the electoral process. What, then, of the potential for electoral influence of the more typical lower-class organization, usually with a few hundred or a few thousand members at best, and usually on the verge of bankruptcy? As for the labor experience itself, the political moral seems to us clear, although it is quite different from the moral that organizers are wont to draw. It can be stated simply: the unorganized disruptions of industrial workers in the 1930s produced some political gains, but the organized electoral activities of the unions could not sustain them. New gains await a new protest movement, a new outbreak of mass defiance capable of spurning the rules and authorities of the workplace and of politics, and capable of spurning the rules and authorities of the union system as well.